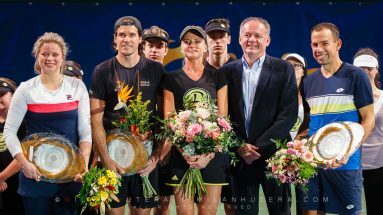 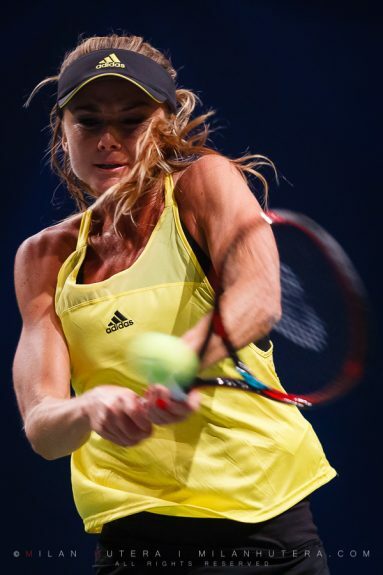 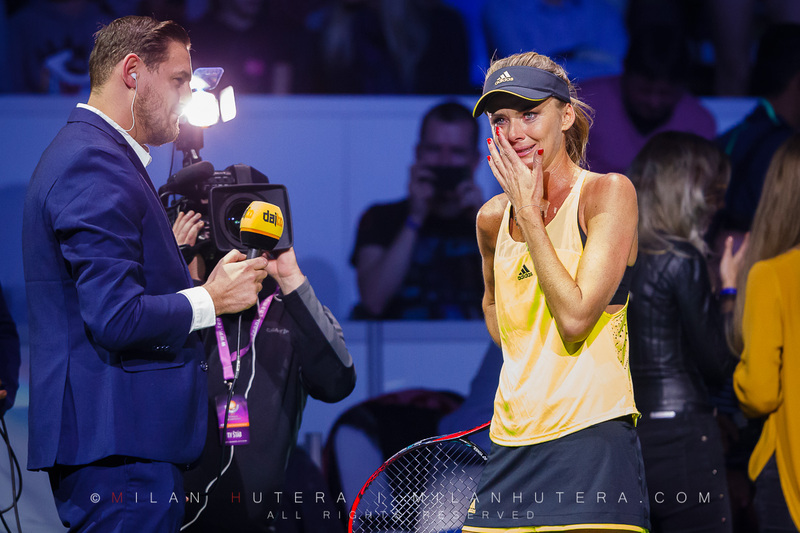 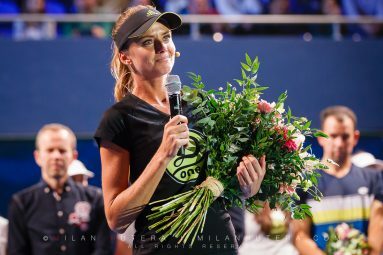 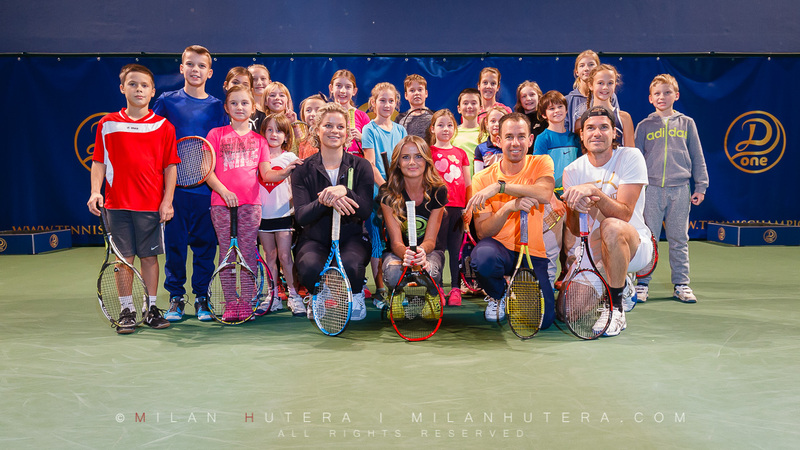 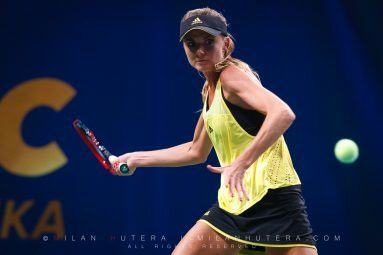 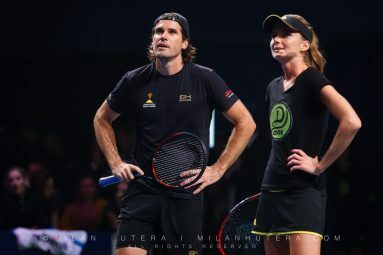 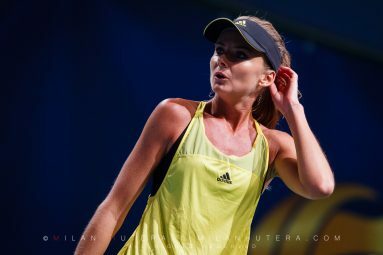 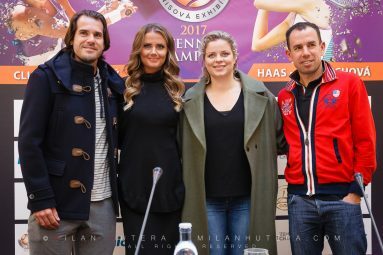 The 10th edition of Tennis Champions Exhibition was dedicated to Daniela Hantuchova, who announced her retirement from professional tennis earlier this year. 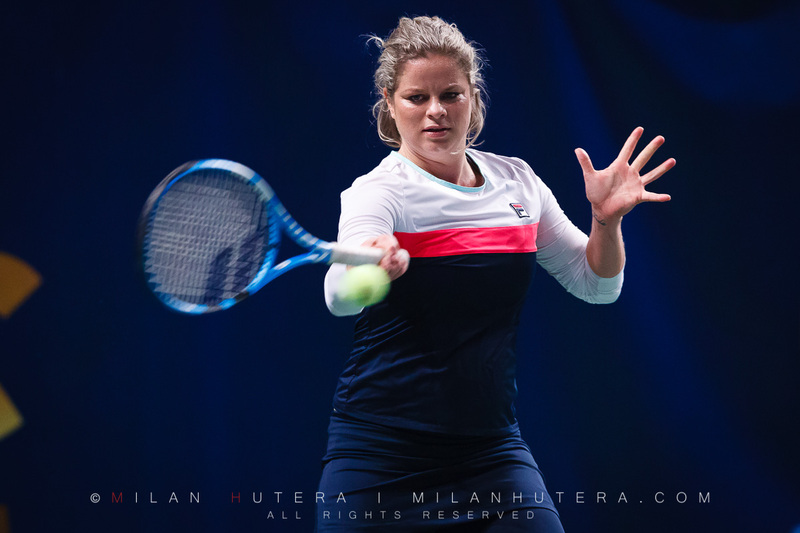 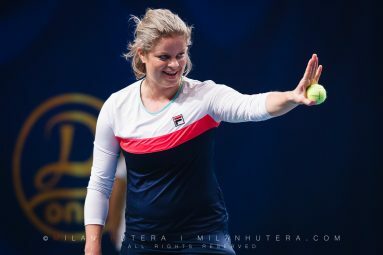 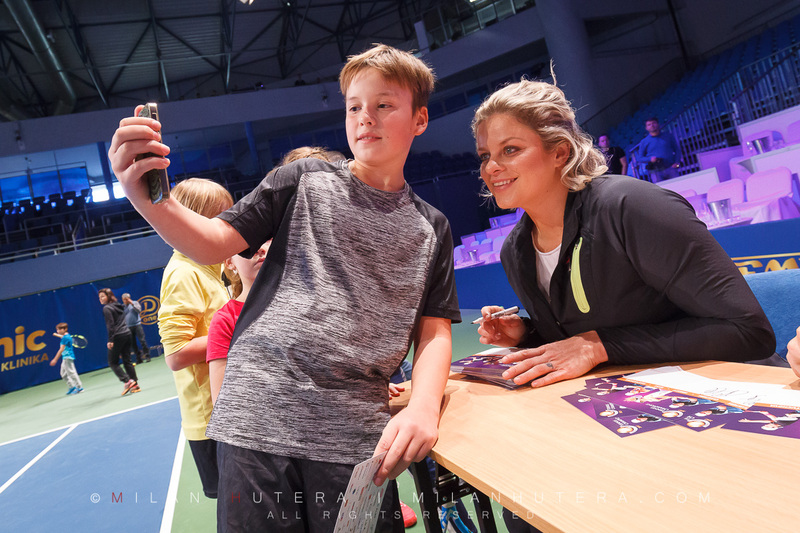 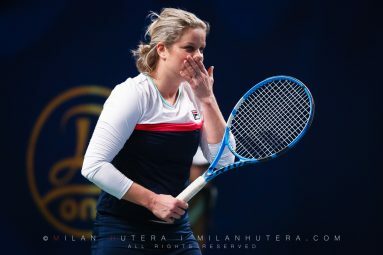 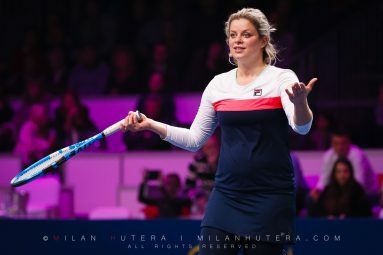 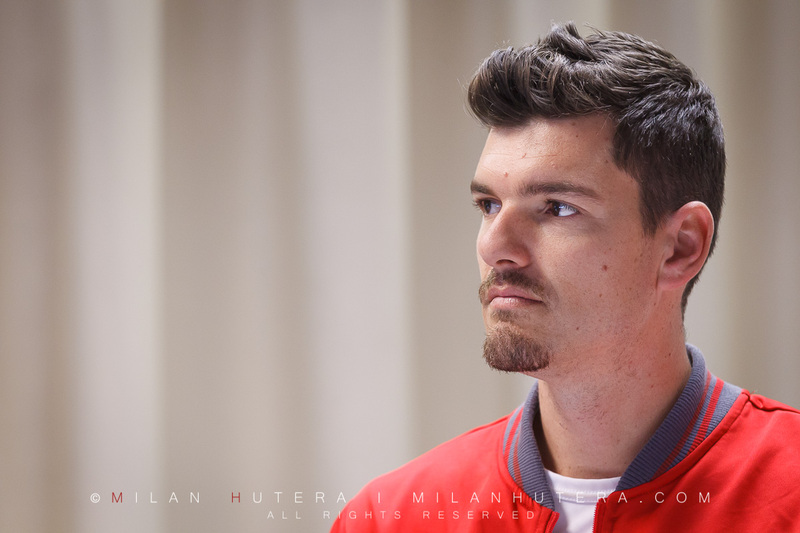 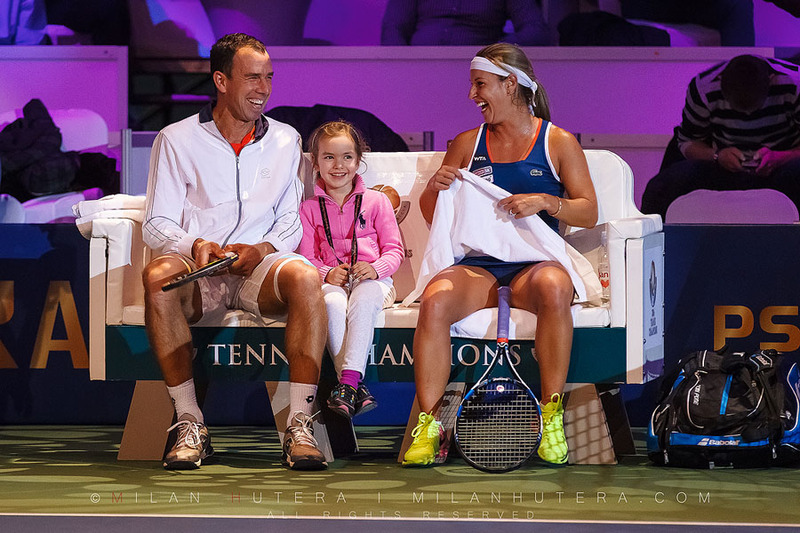 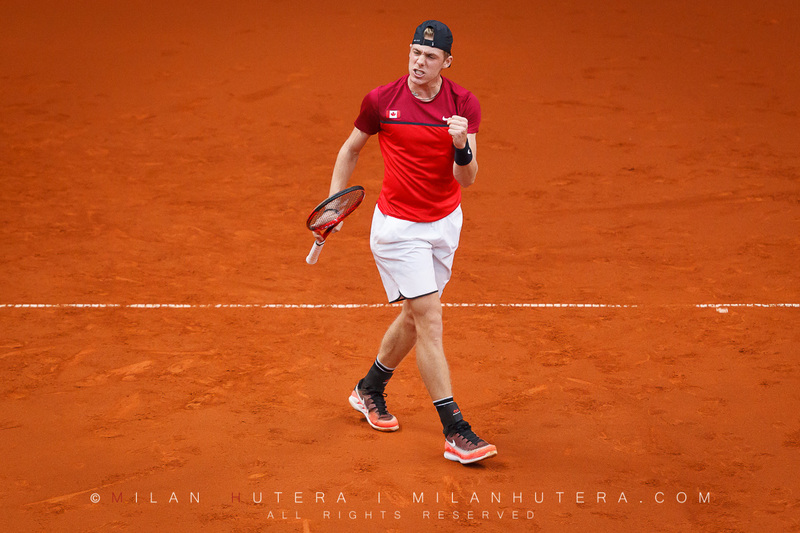 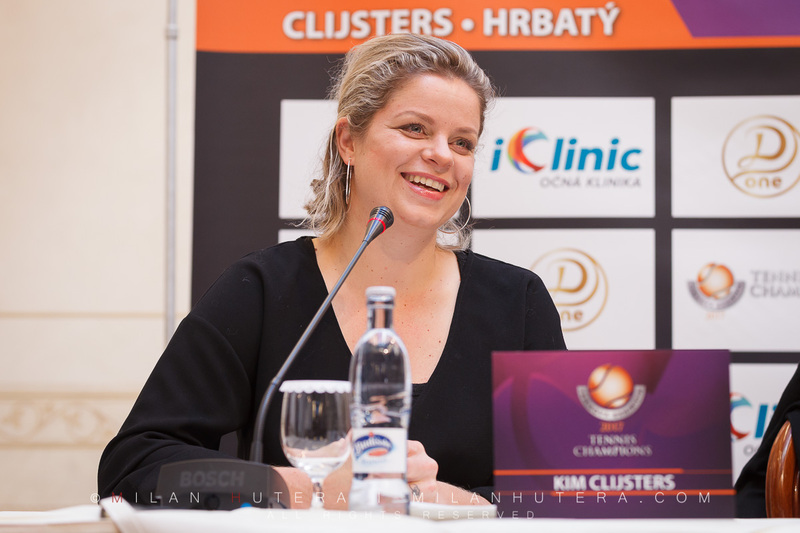 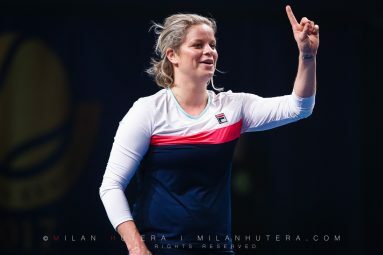 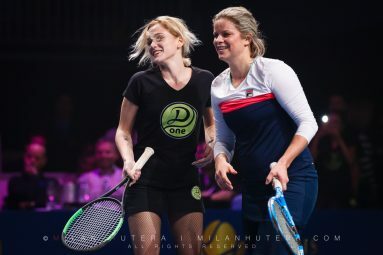 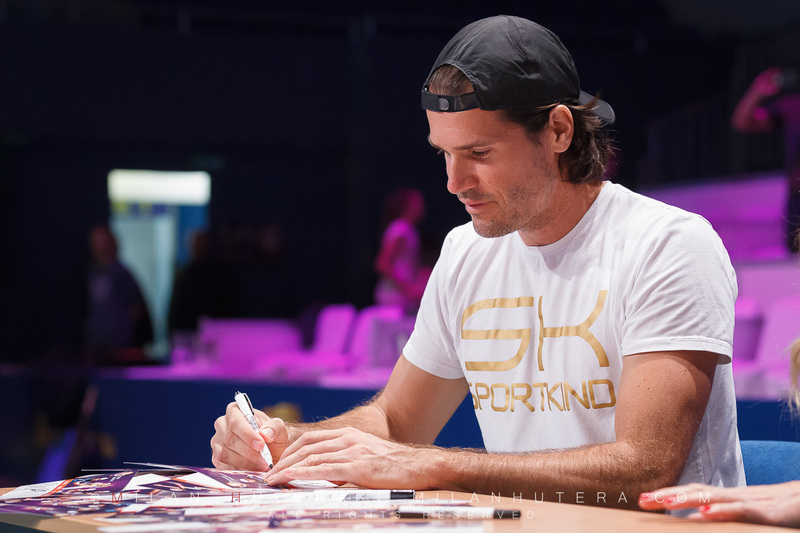 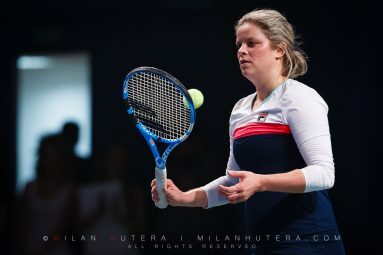 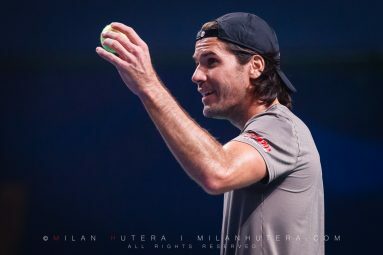 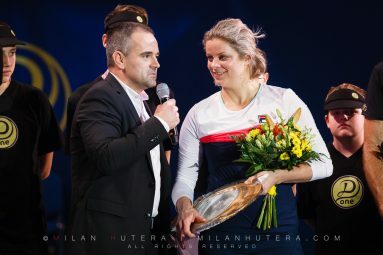 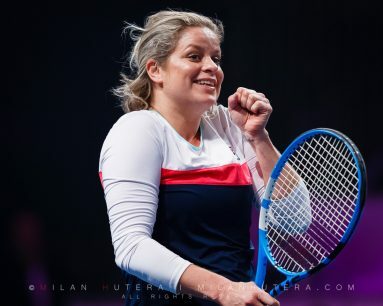 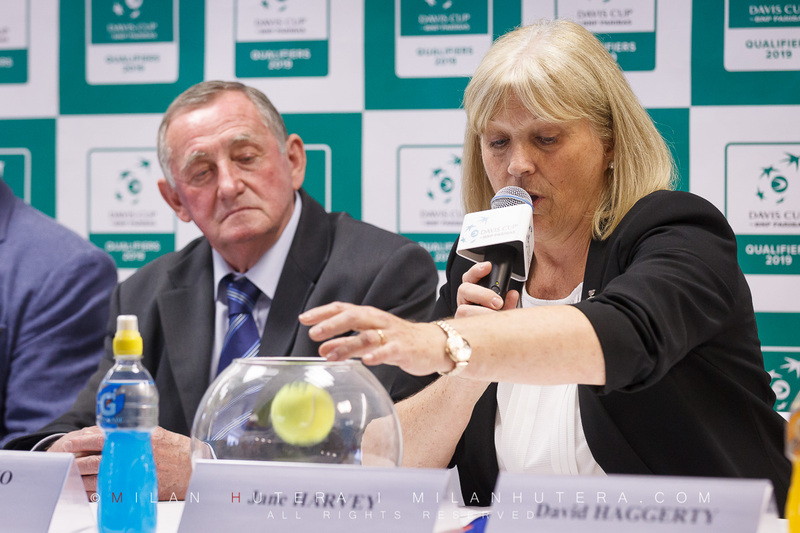 Her three guests were Kim Clijsters, Tommy Haas and Slovak Davis Cup hero Dominik Hrbaty. 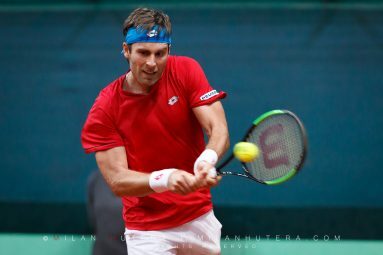 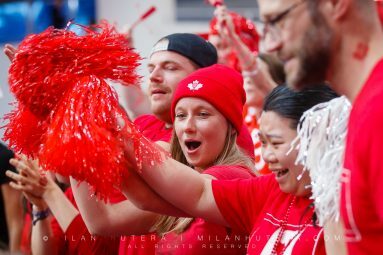 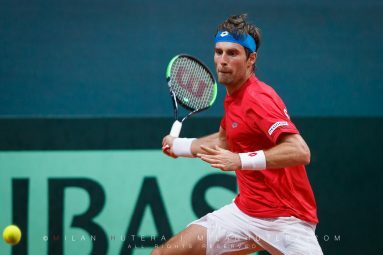 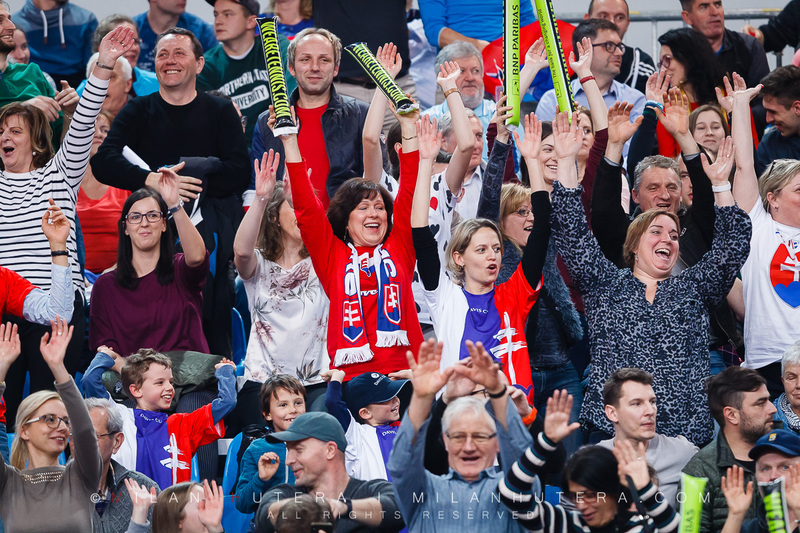 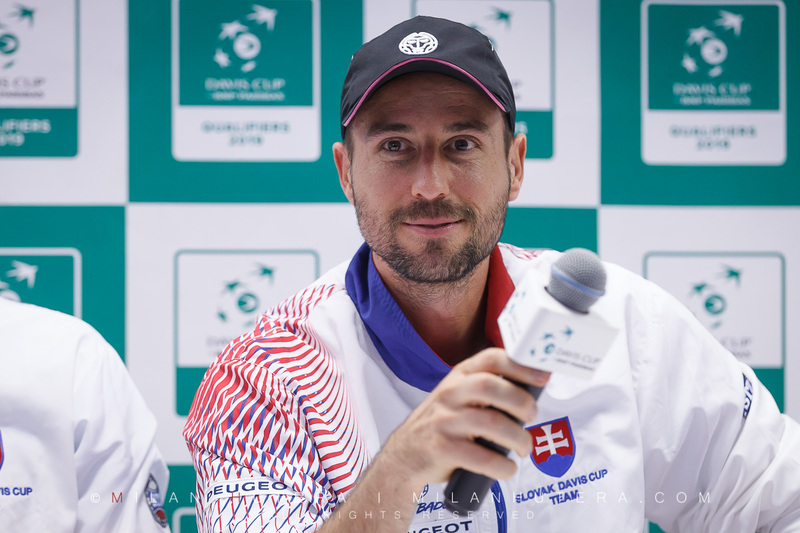 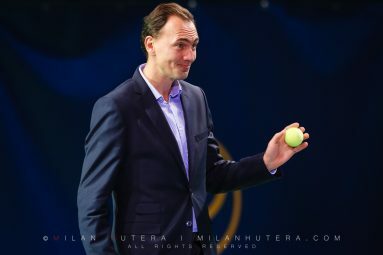 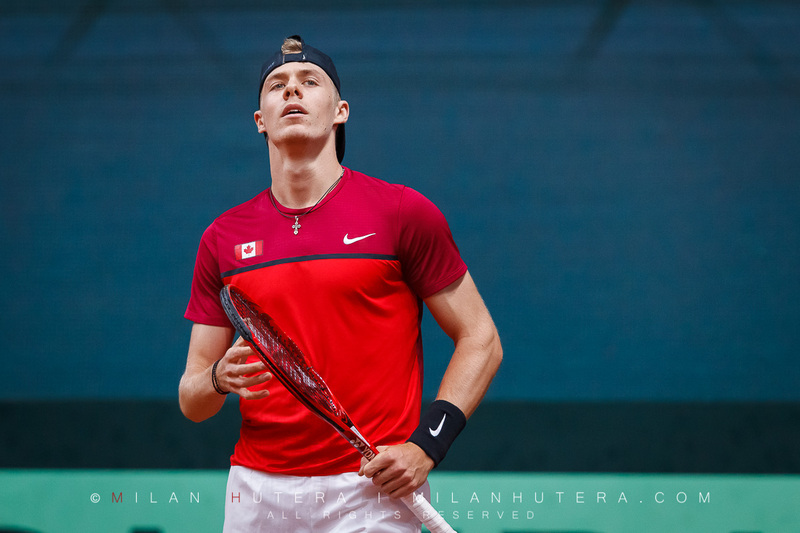 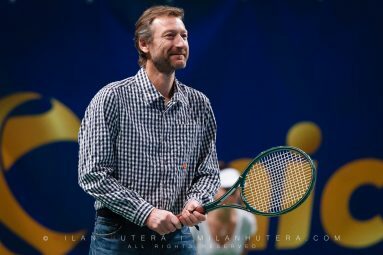 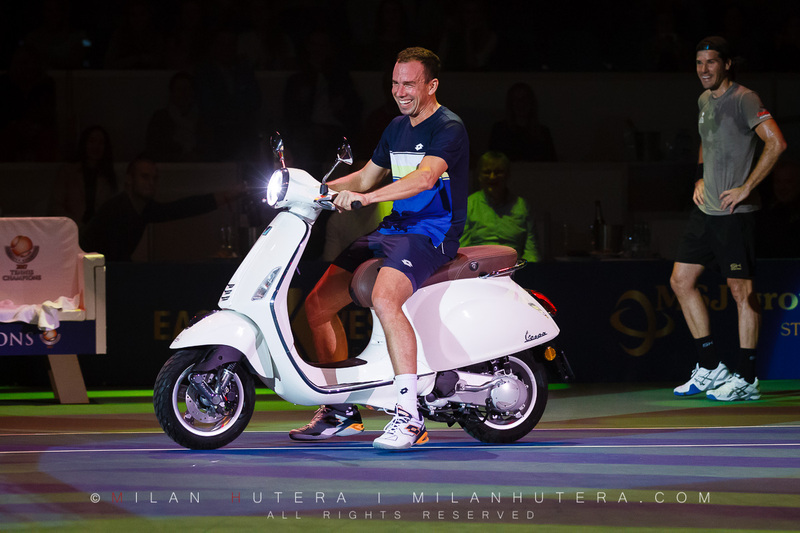 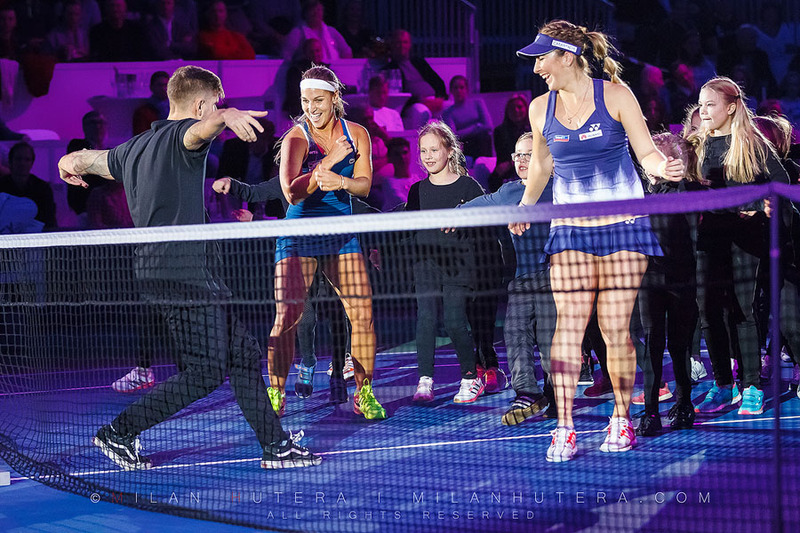 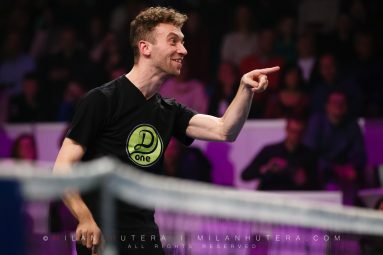 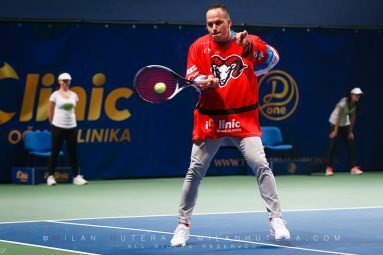 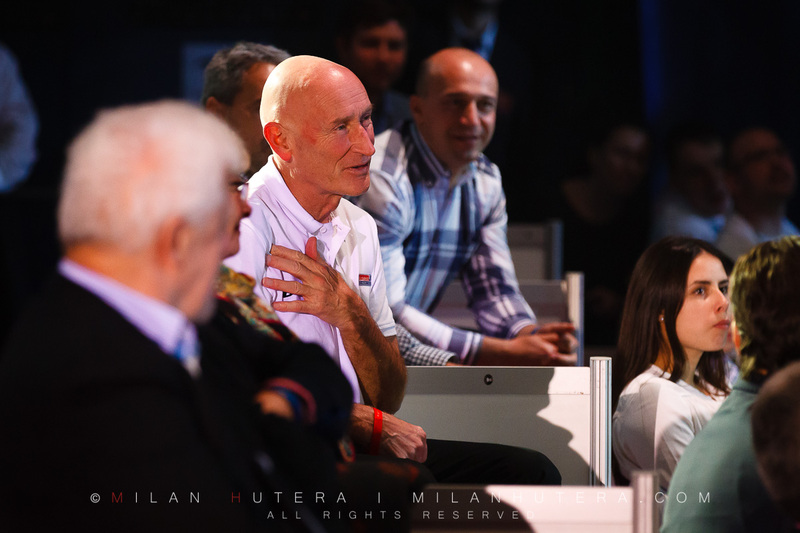 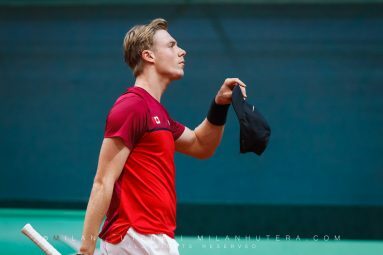 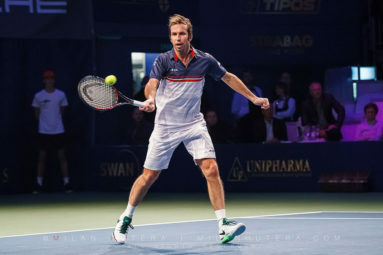 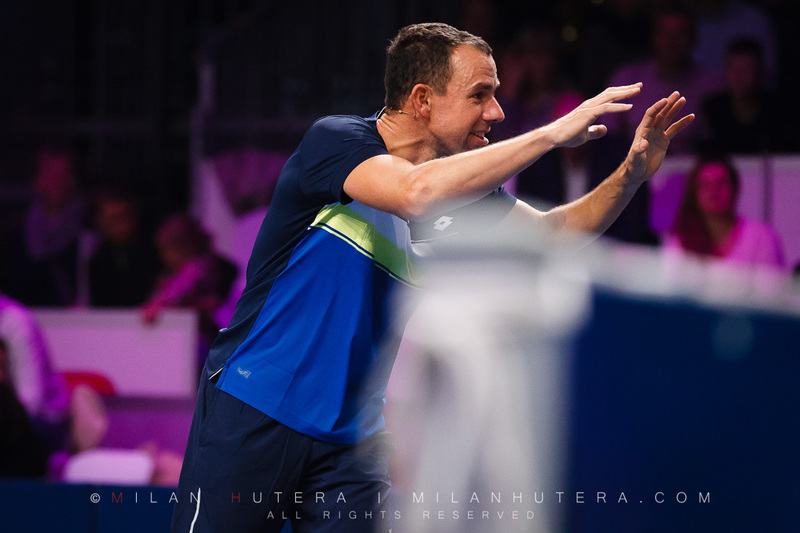 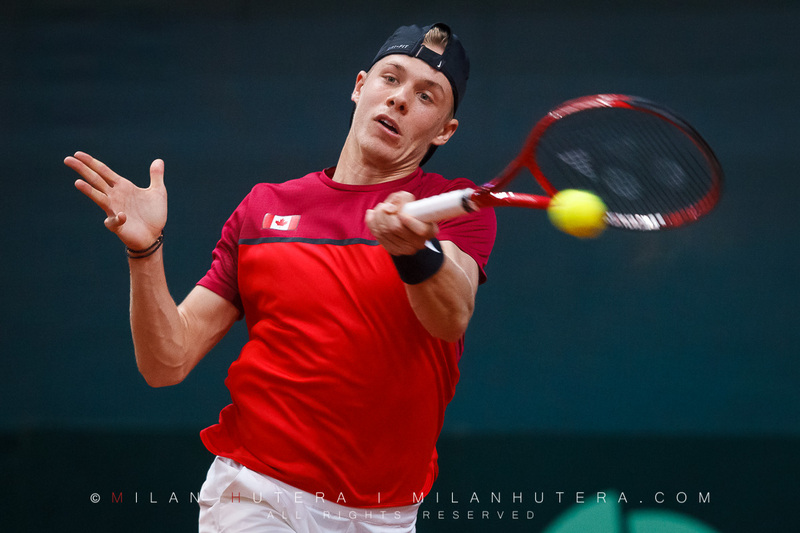 Additional guests included winning Slovak Fed Cup Team of 2002, various hockey players, Daniela’s colleagues from Slovak edition of Dancing with the Stars and Daniela’s childhood hero Miloslav Mecir. 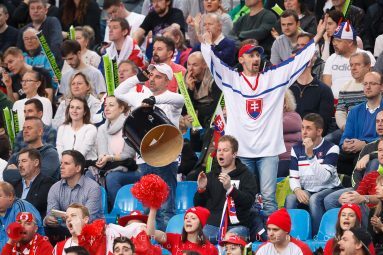 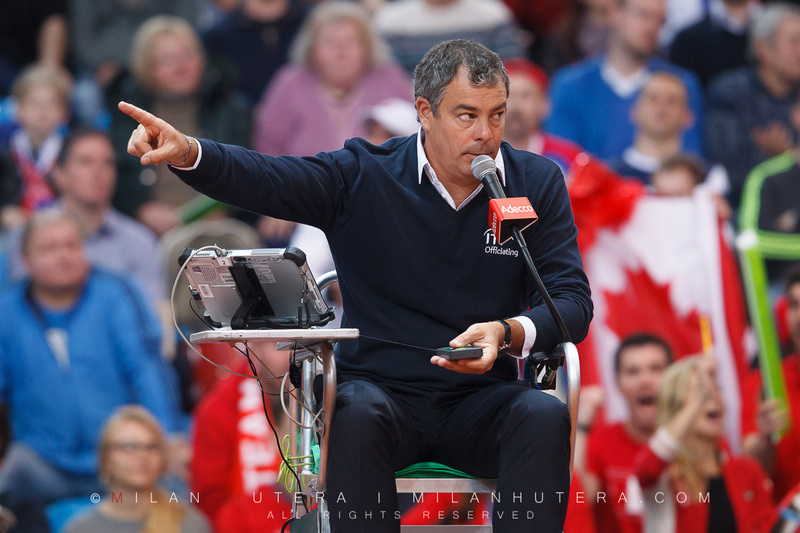 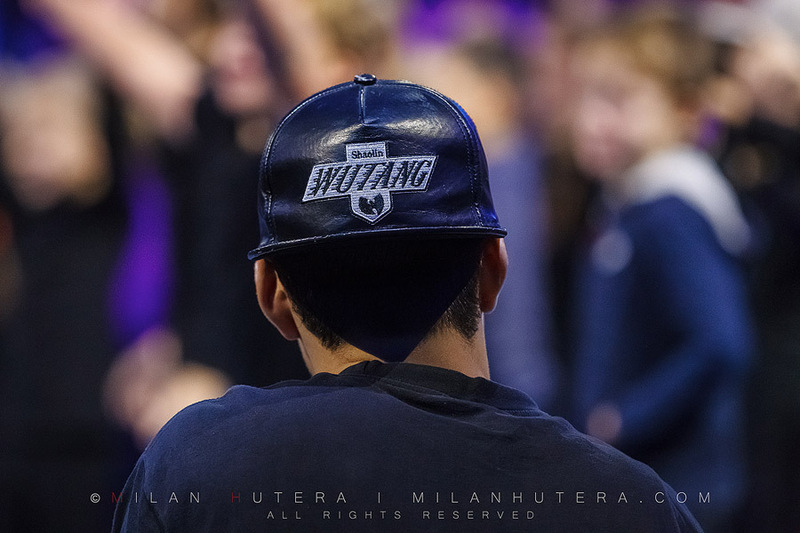 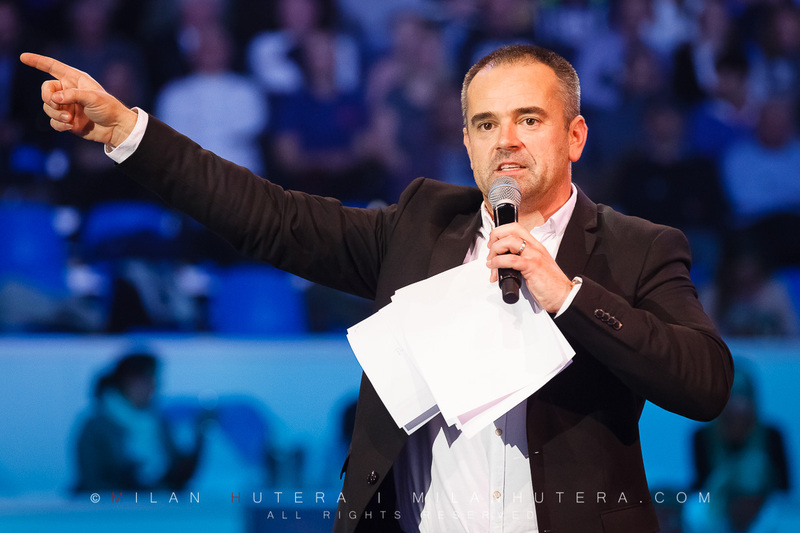 The sold out arena also saw very special appearance of the President of Slovakia Andrej Kiska. 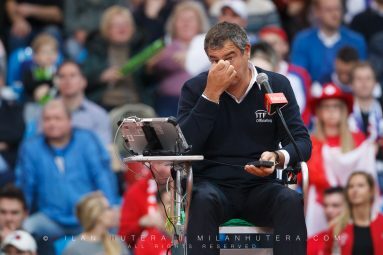 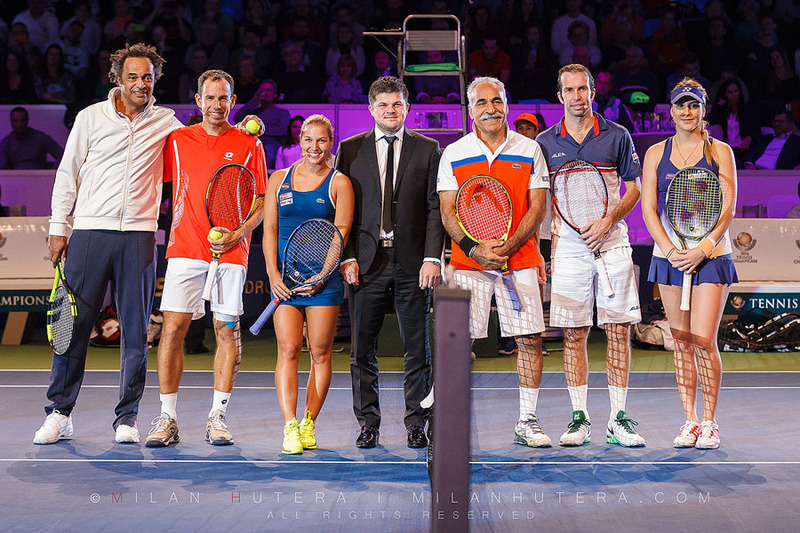 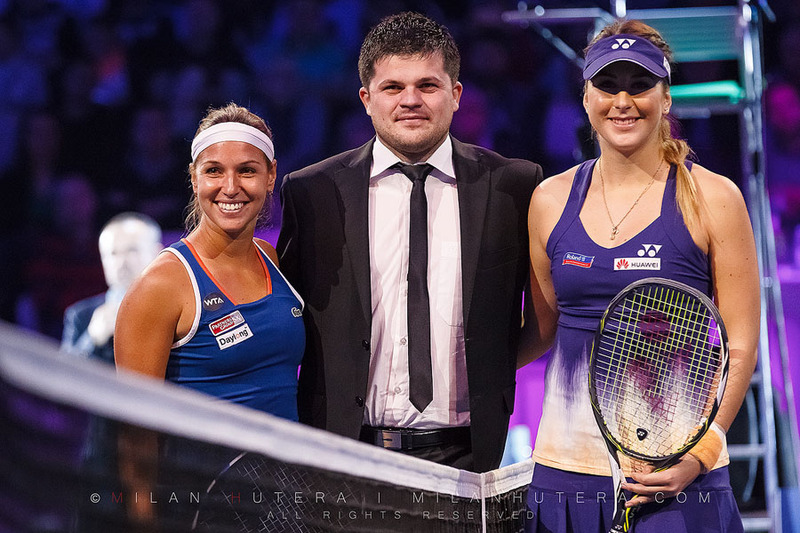 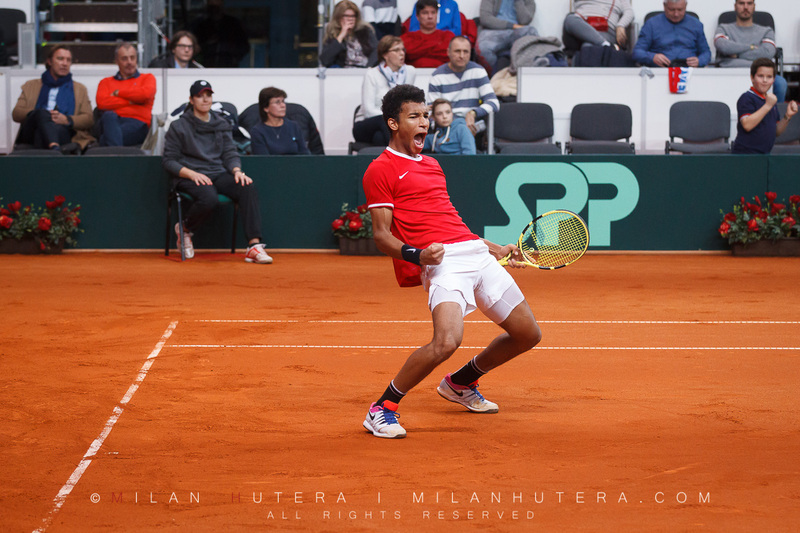 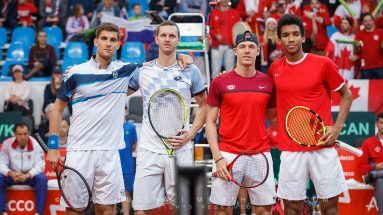 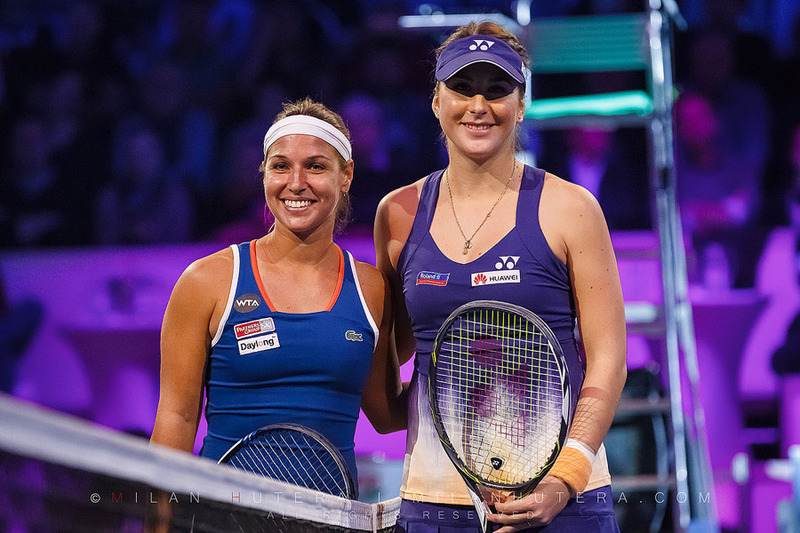 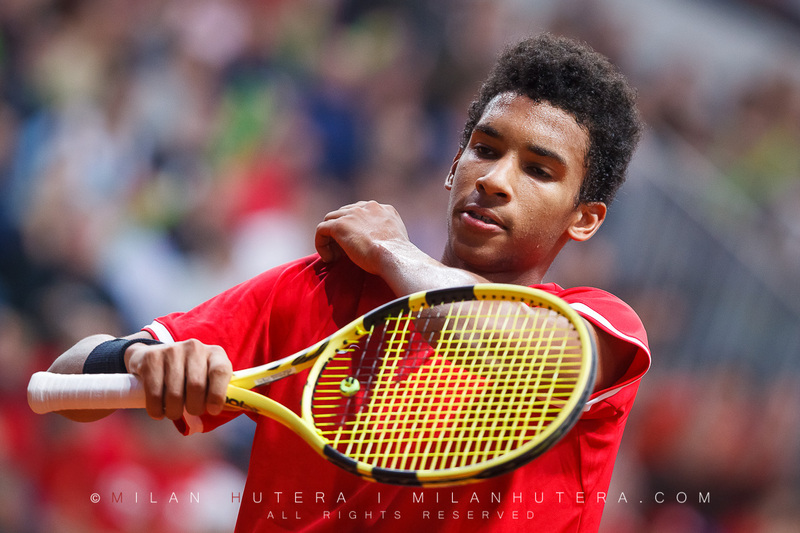 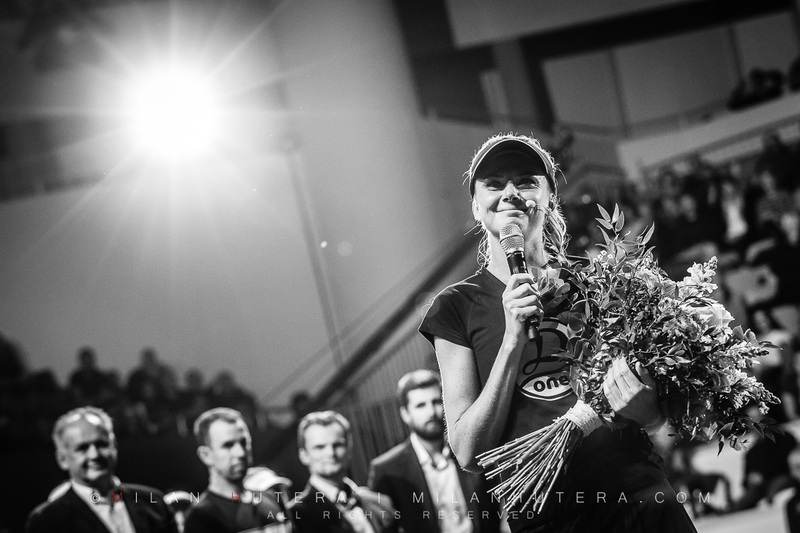 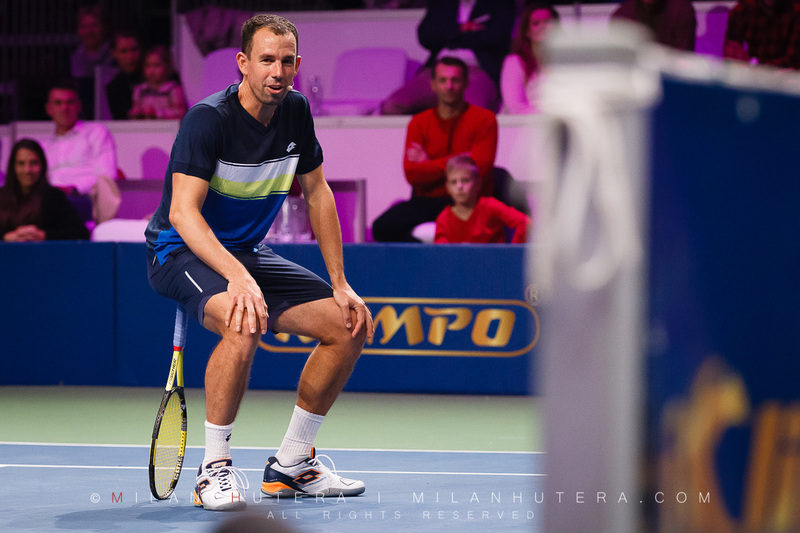 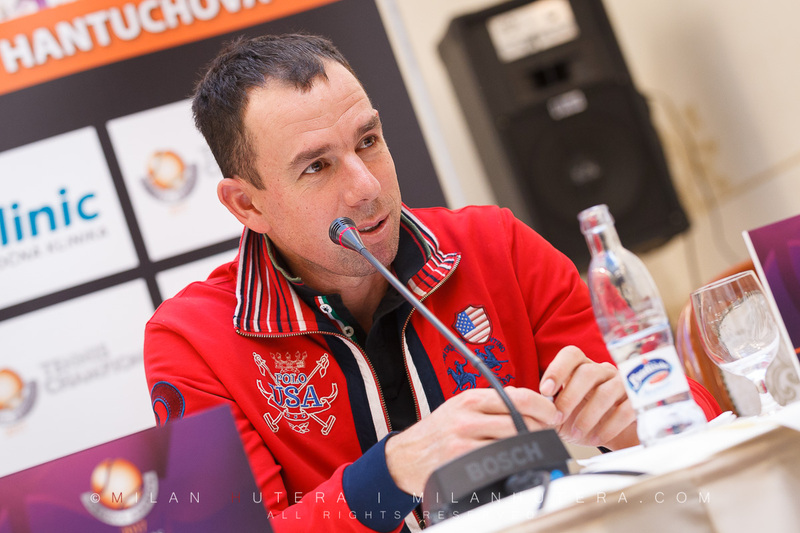 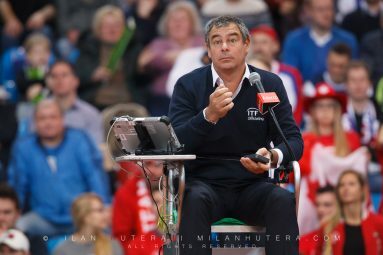 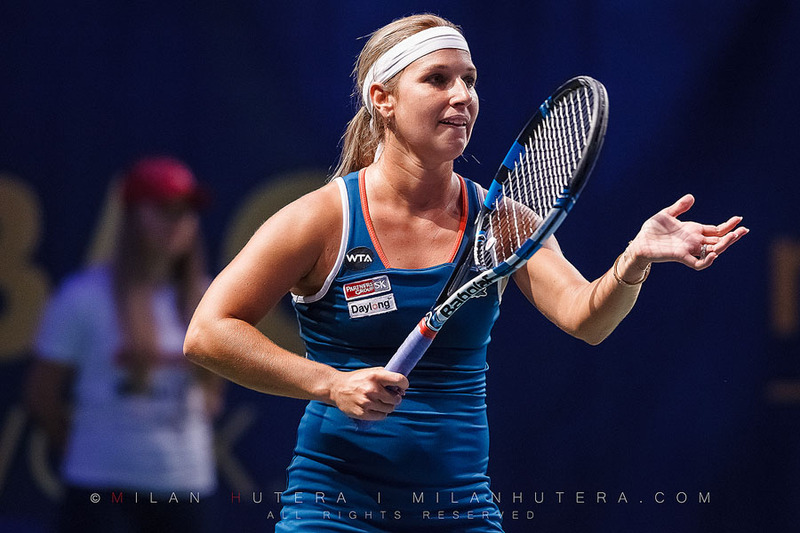 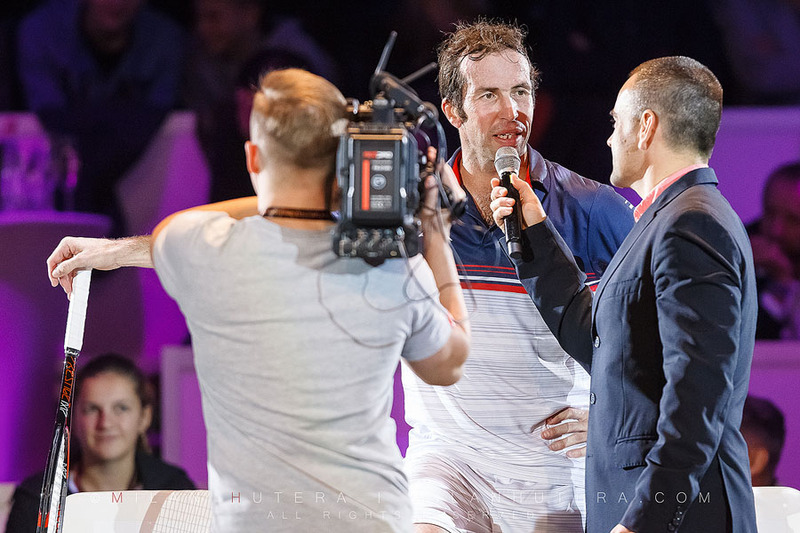 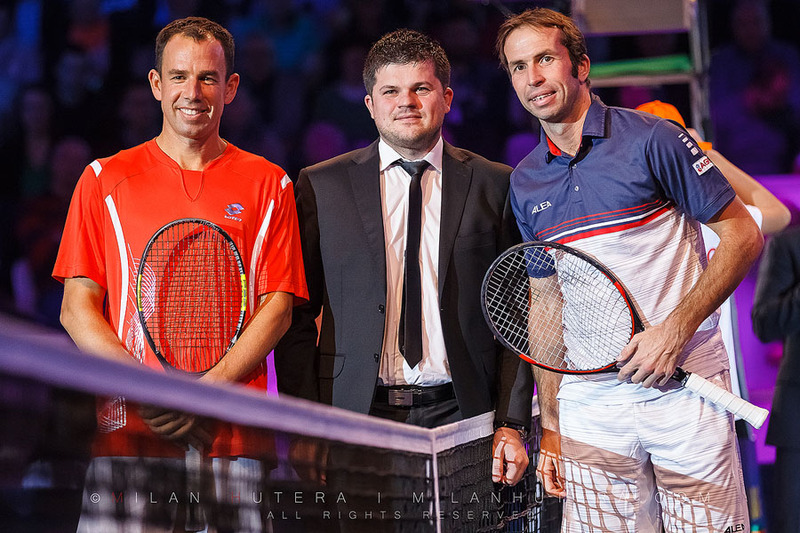 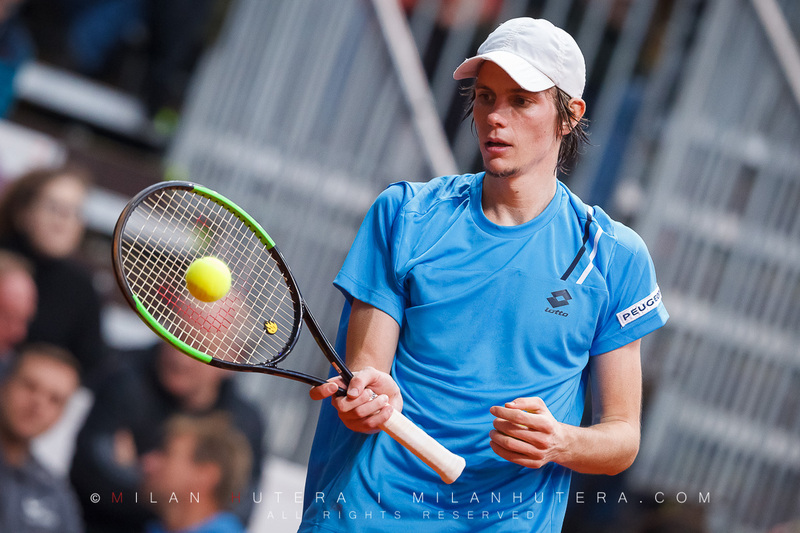 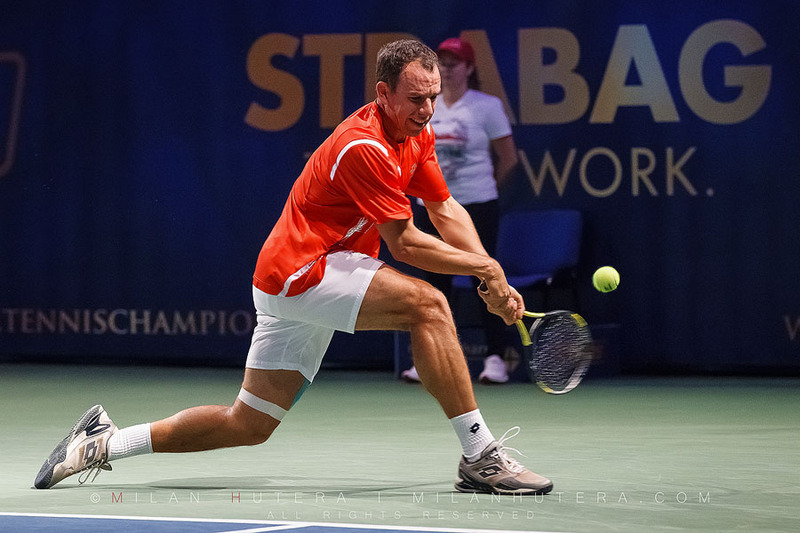 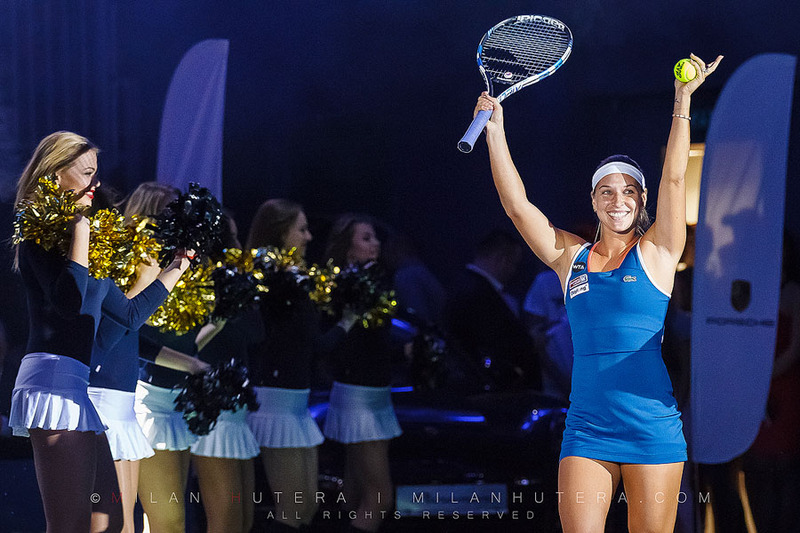 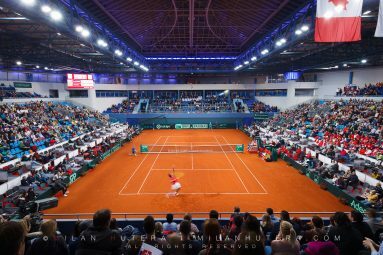 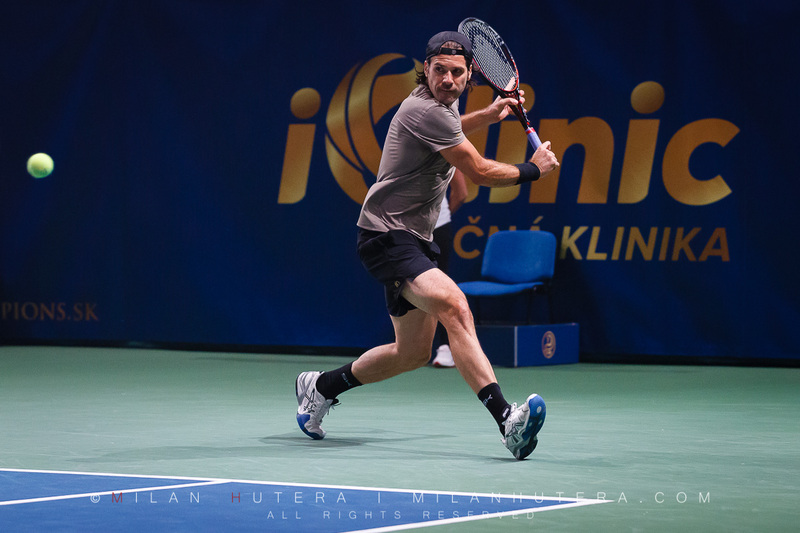 In mid November I attended the 9th edition of Tennis Chamipons Exhibition in Bratislava. 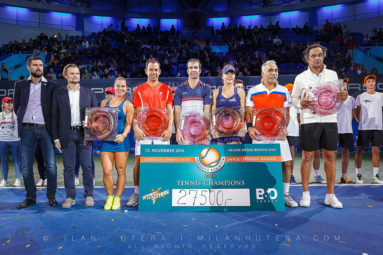 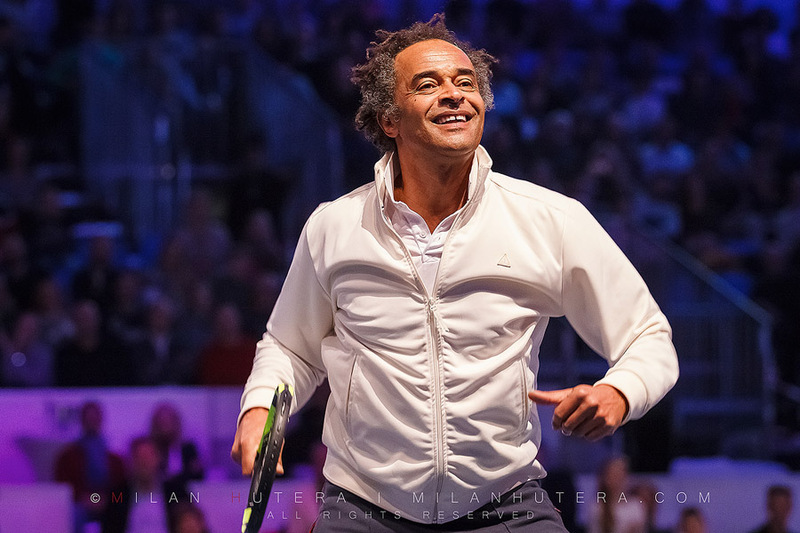 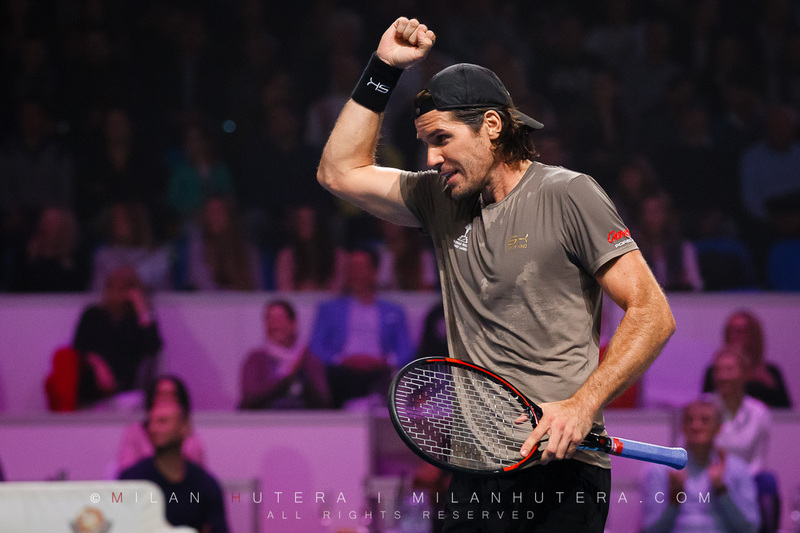 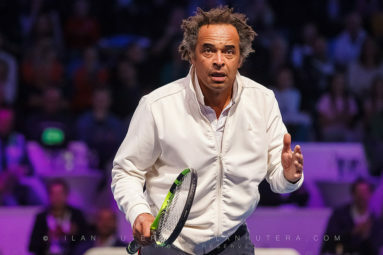 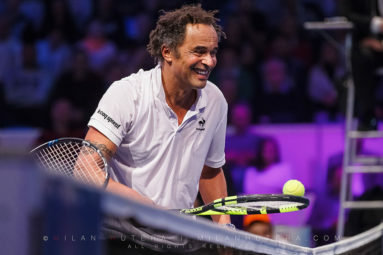 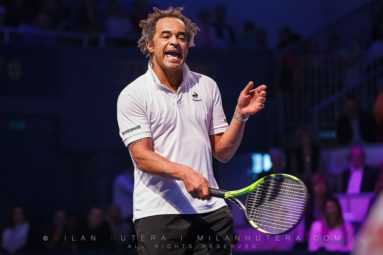 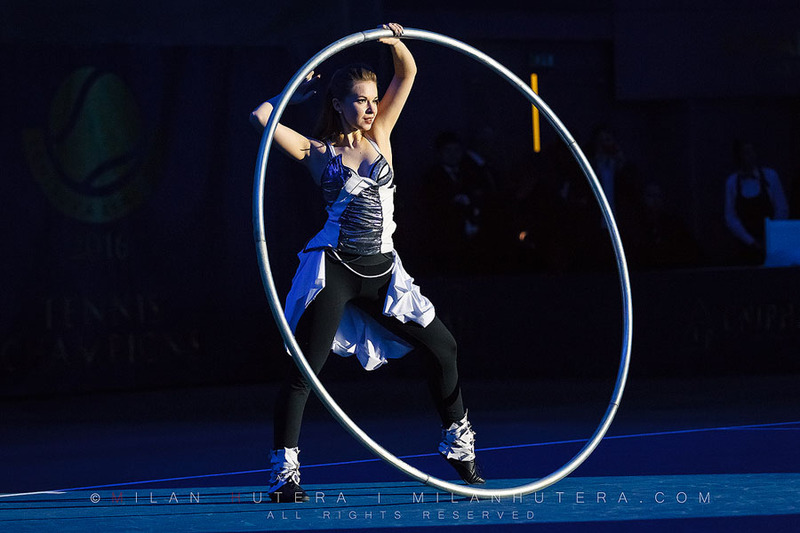 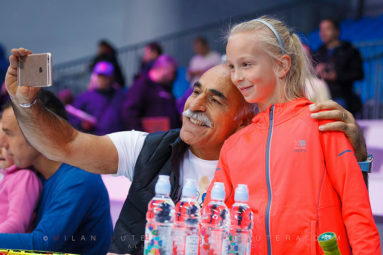 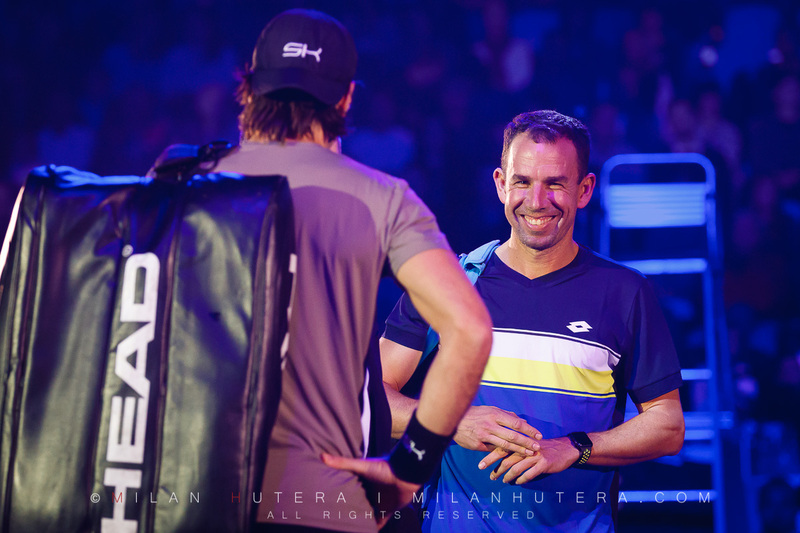 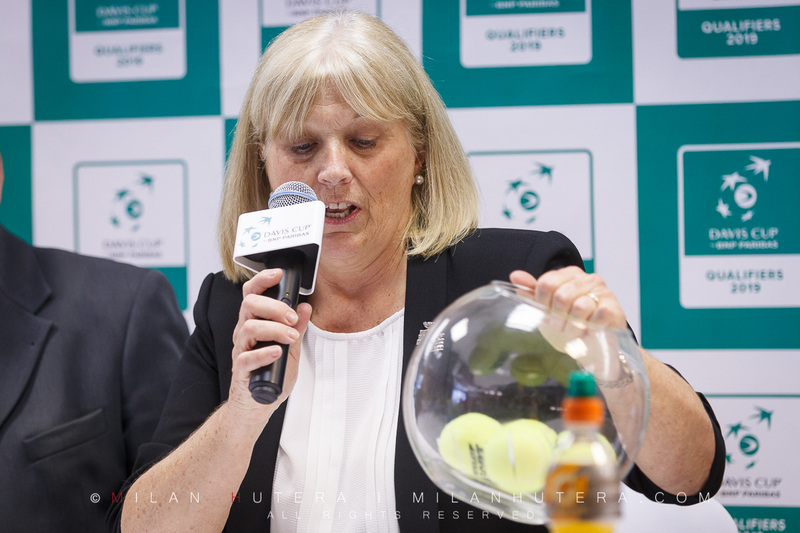 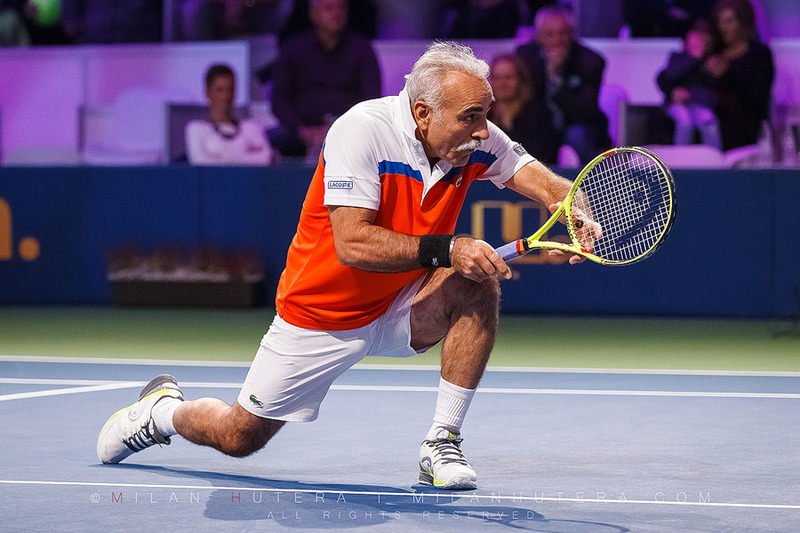 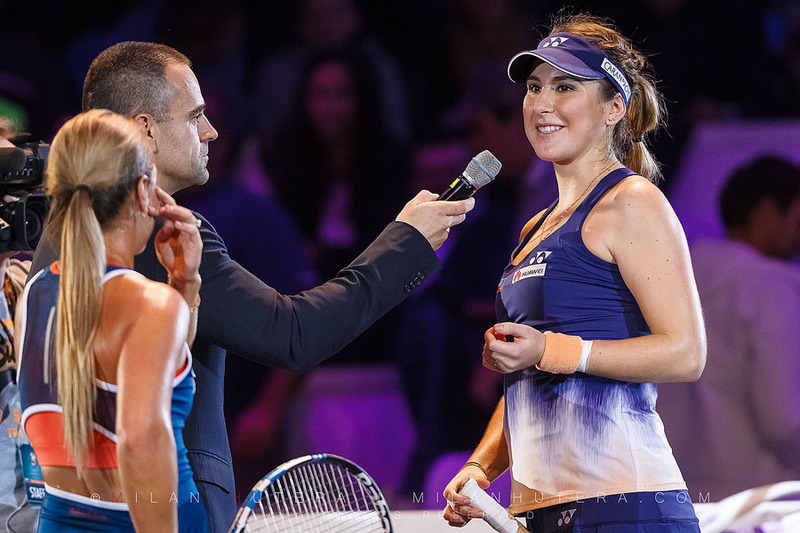 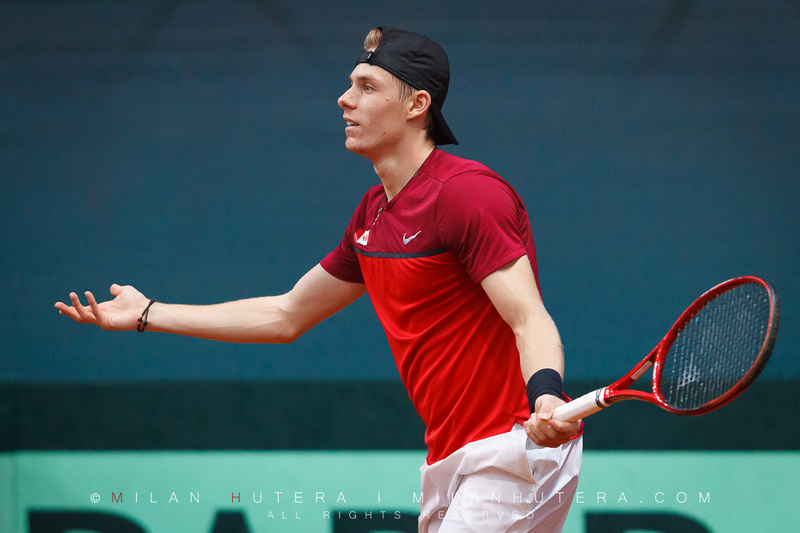 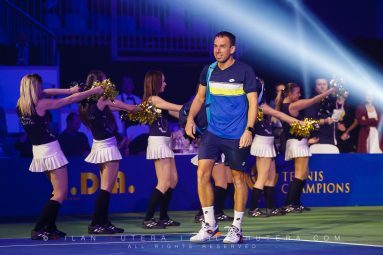 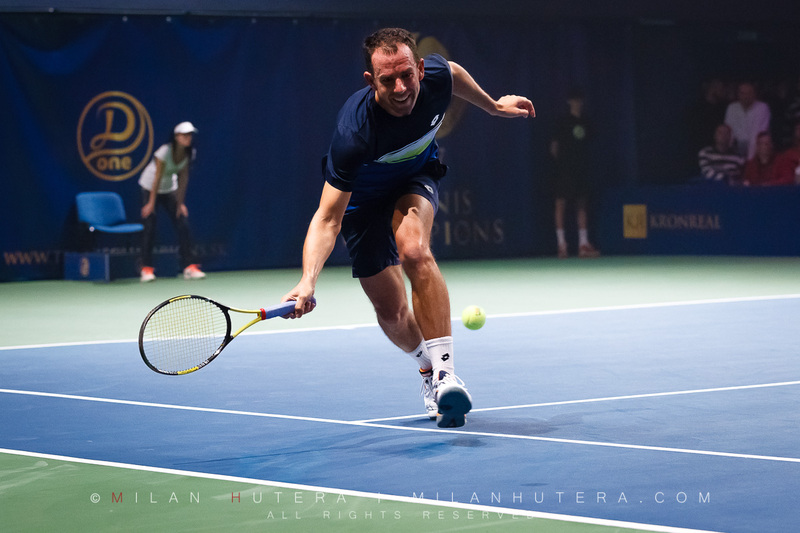 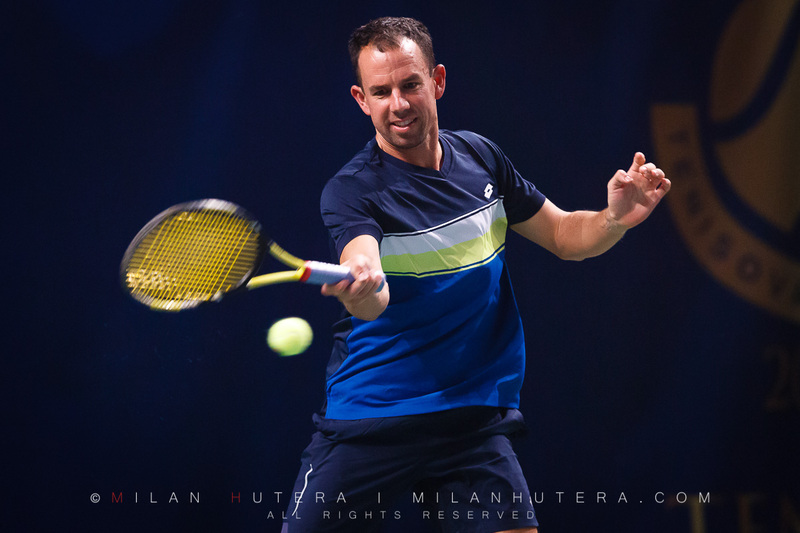 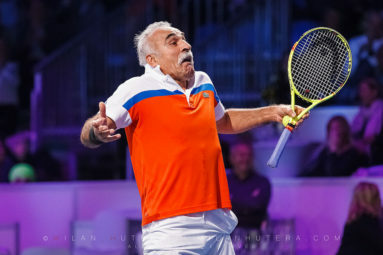 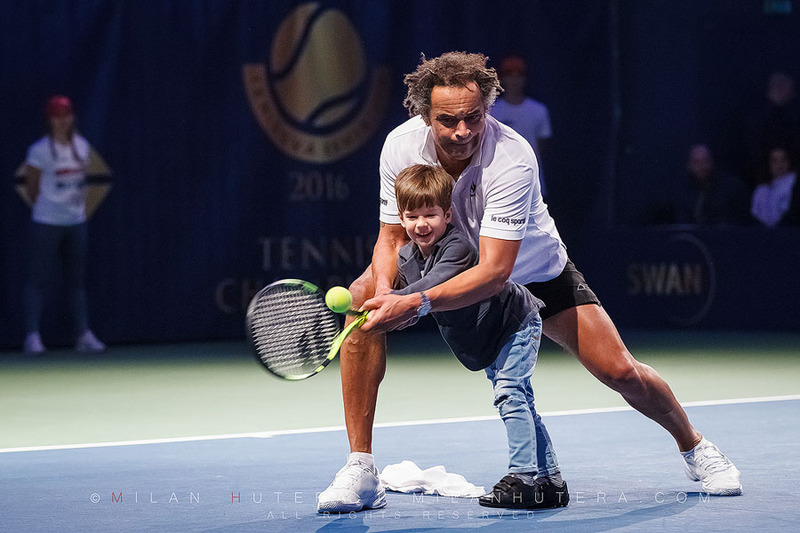 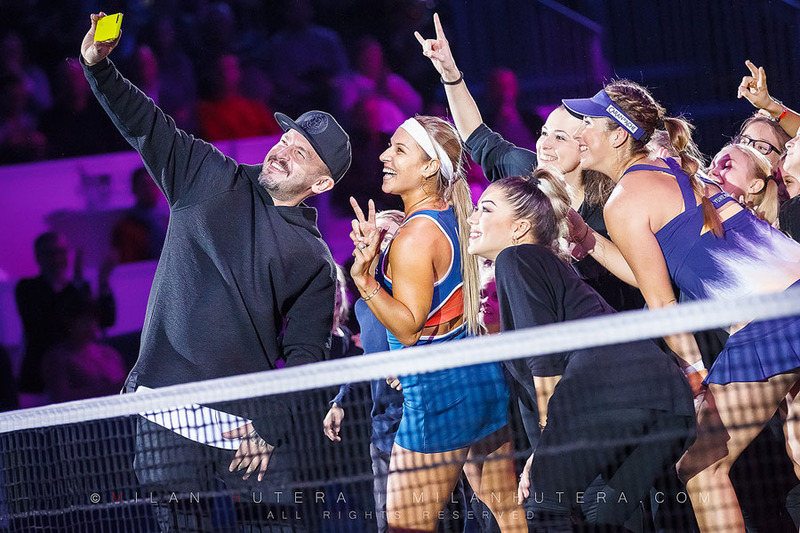 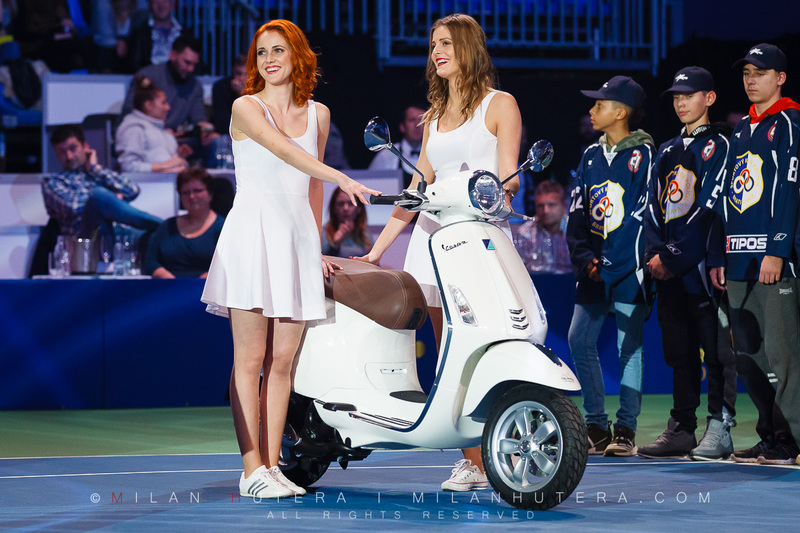 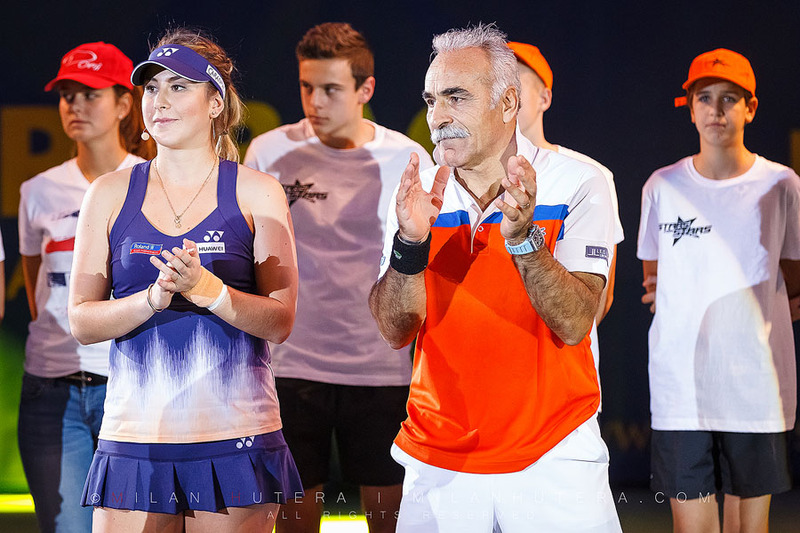 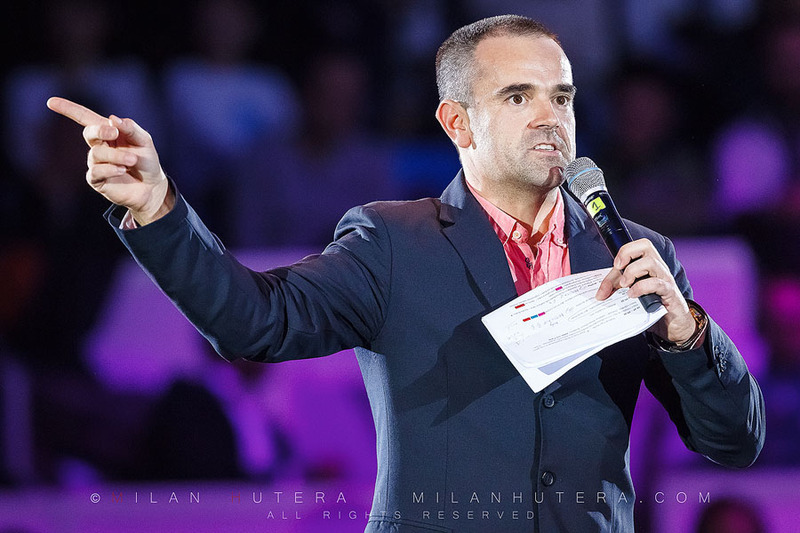 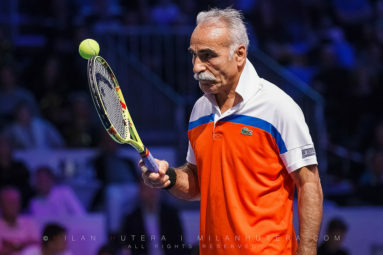 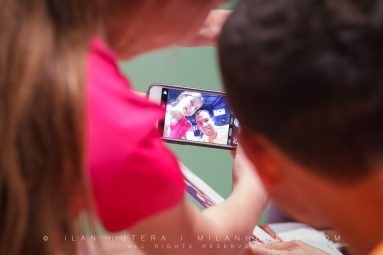 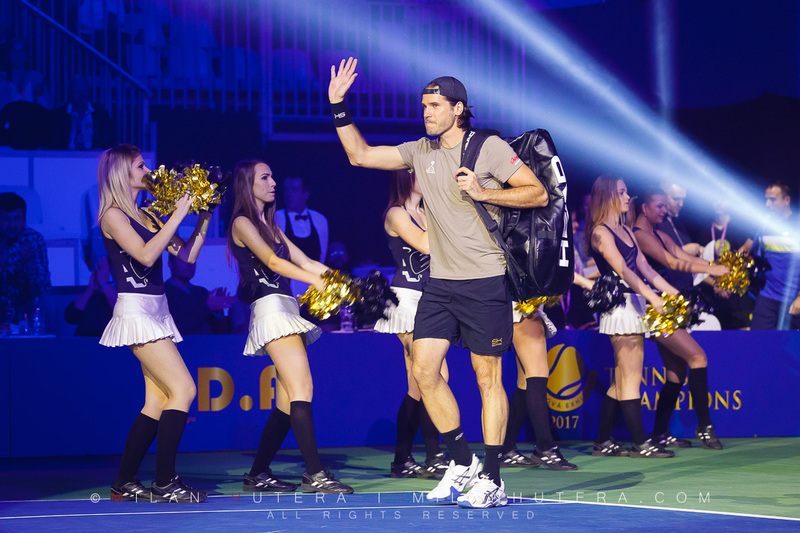 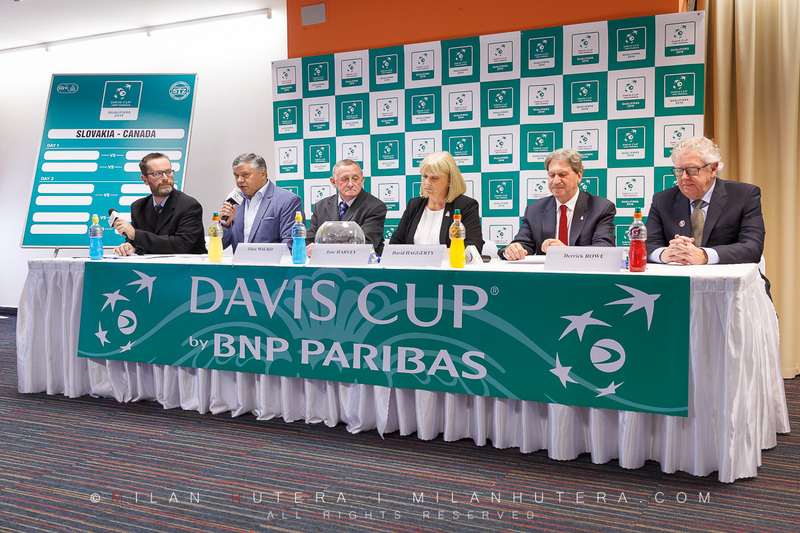 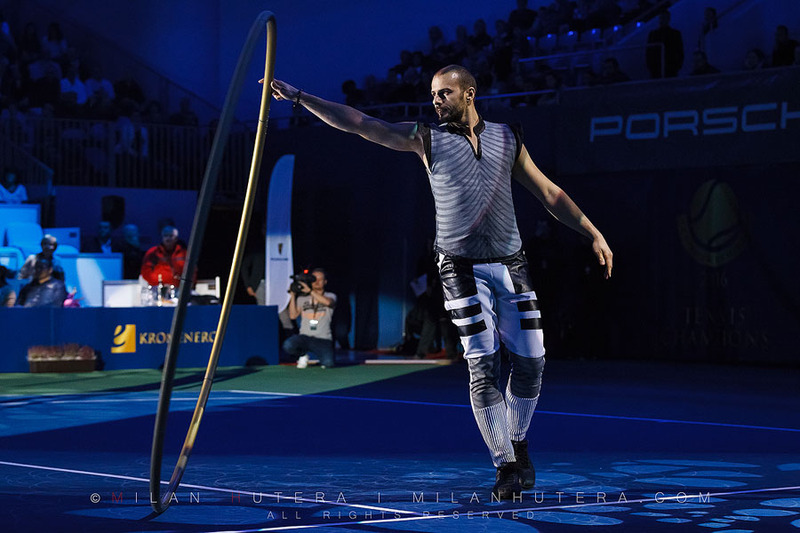 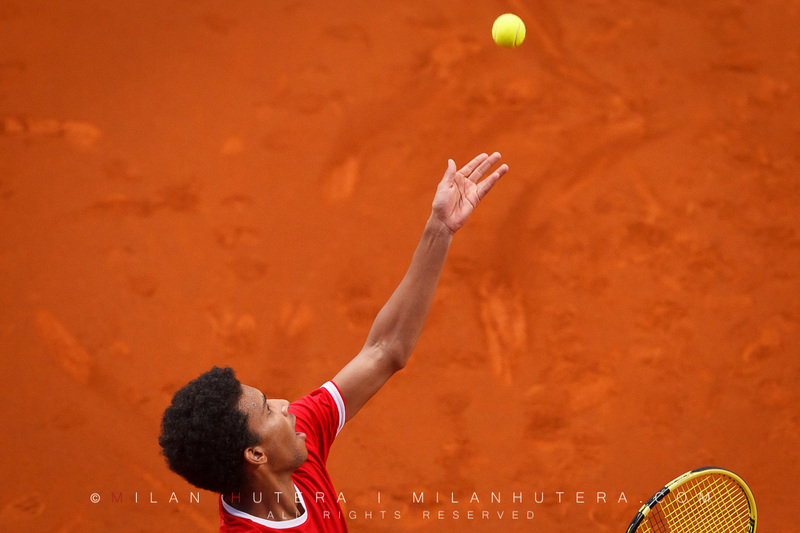 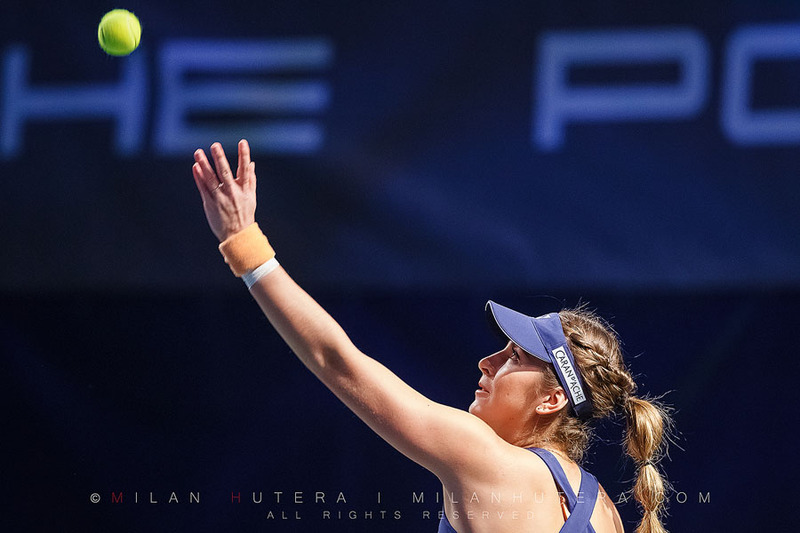 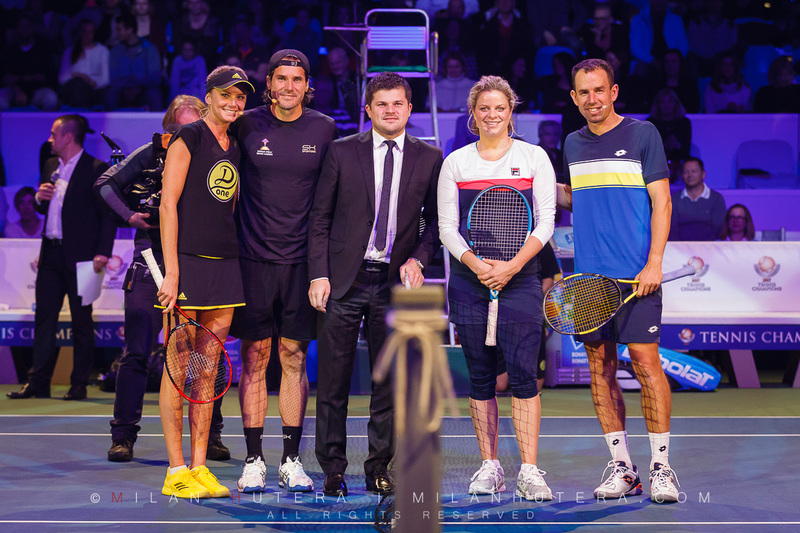 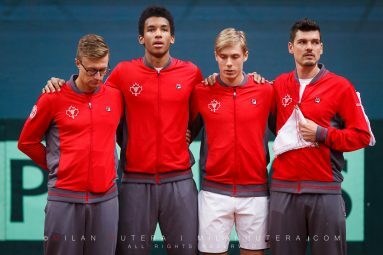 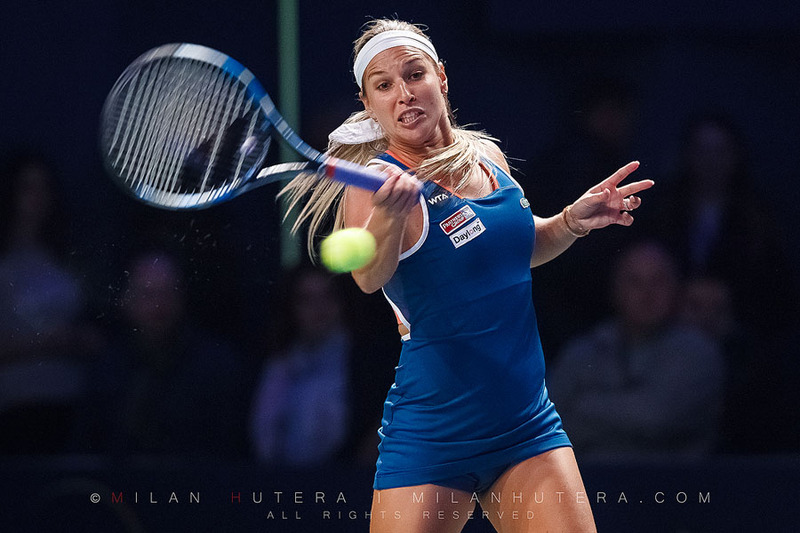 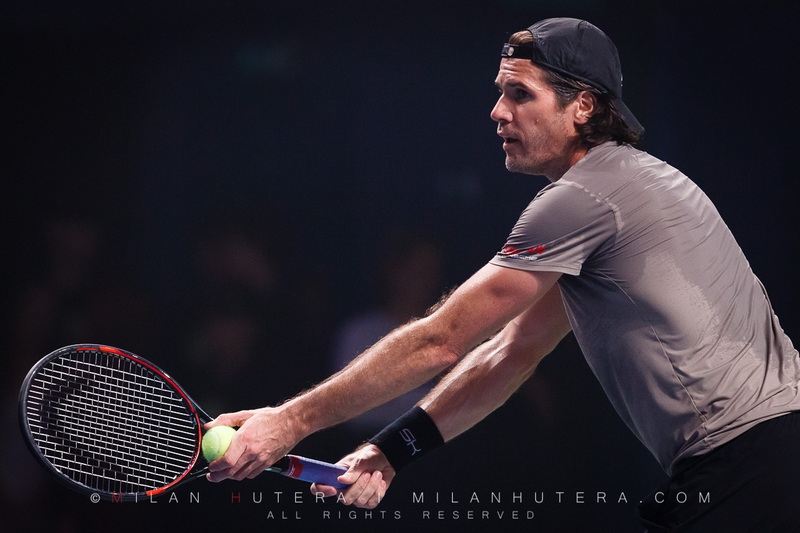 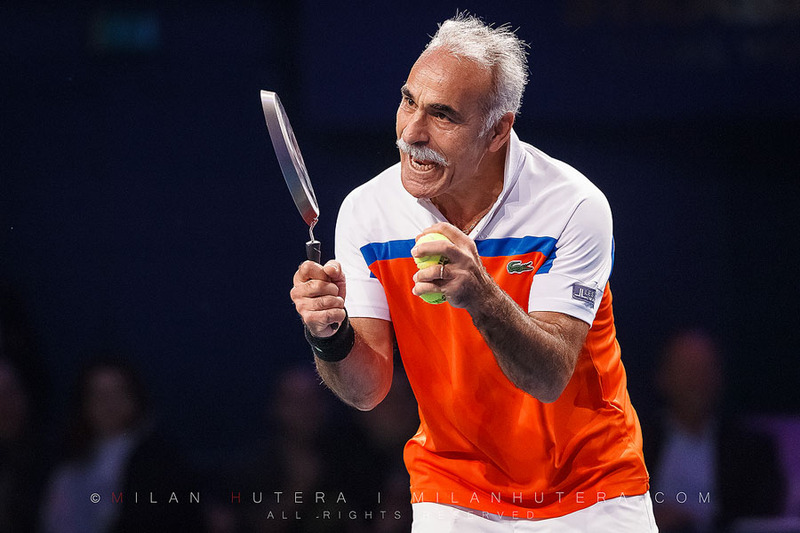 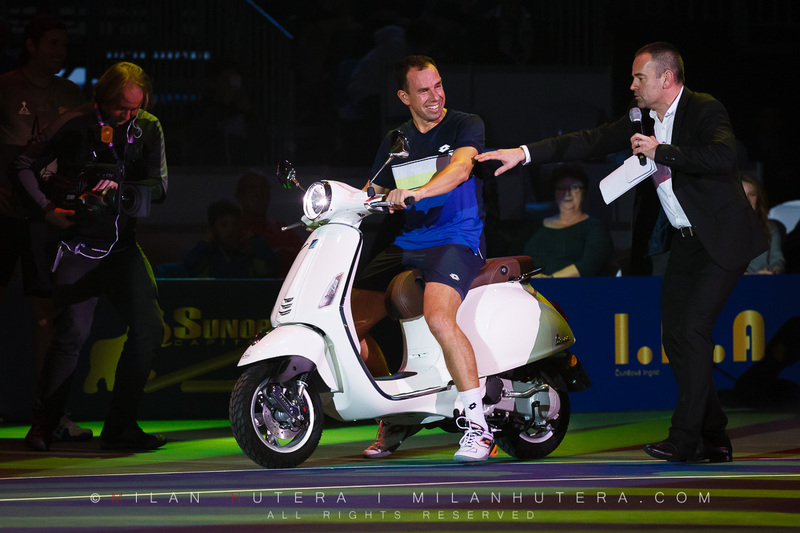 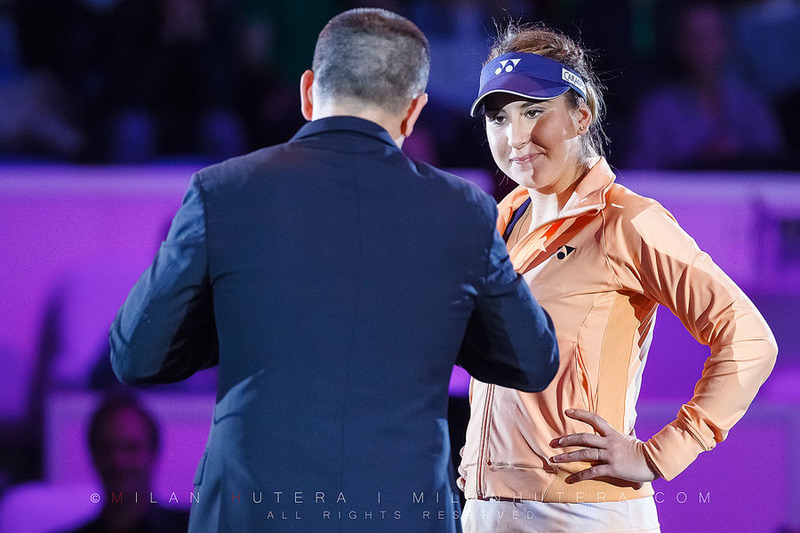 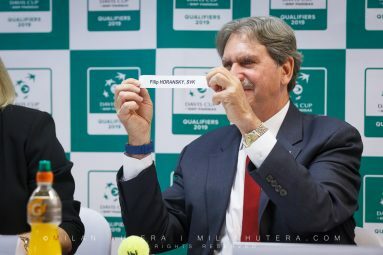 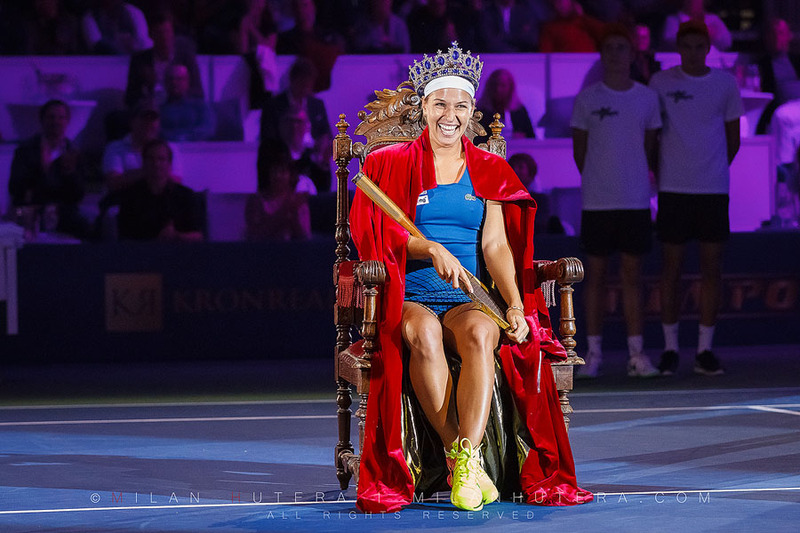 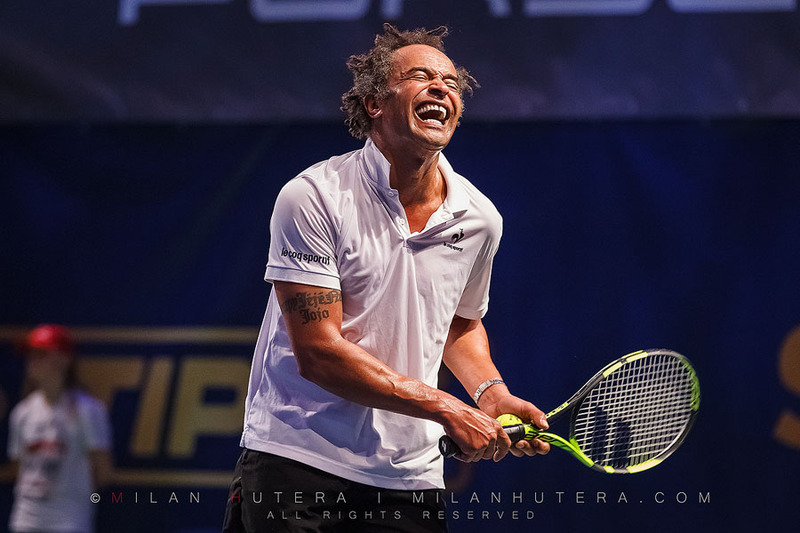 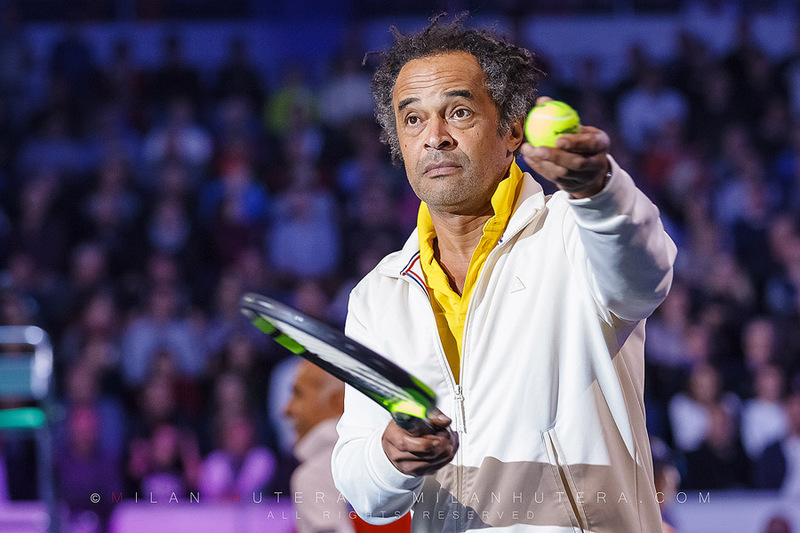 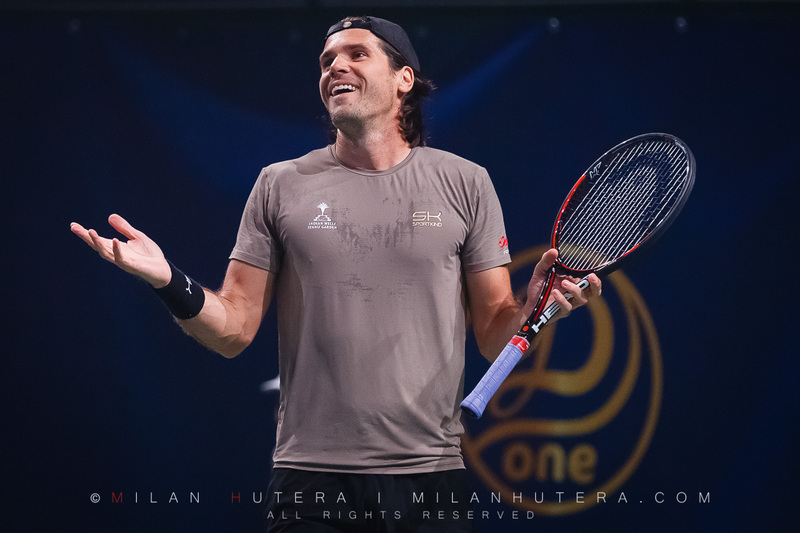 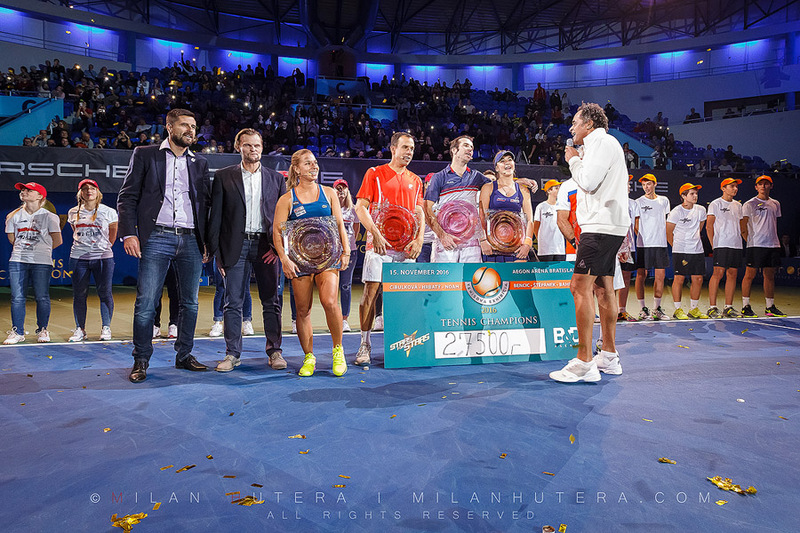 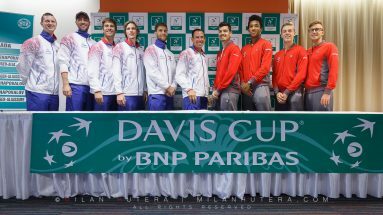 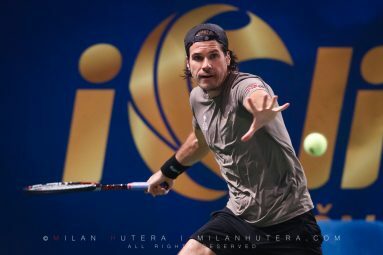 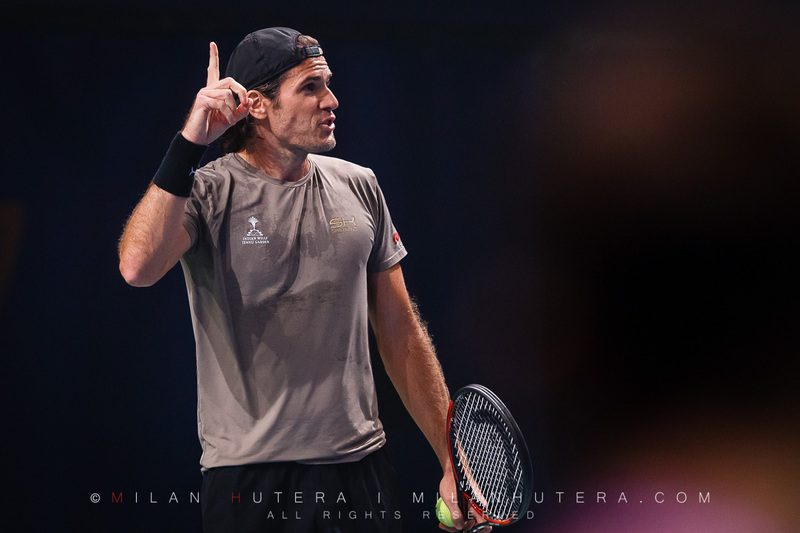 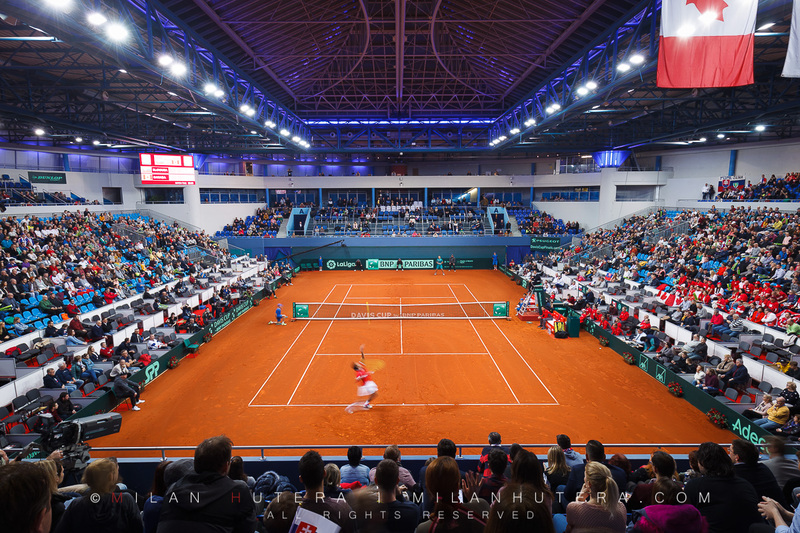 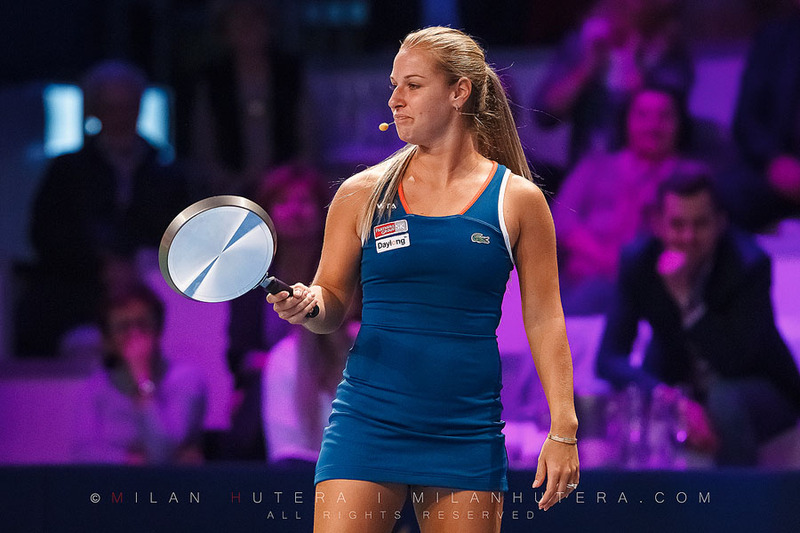 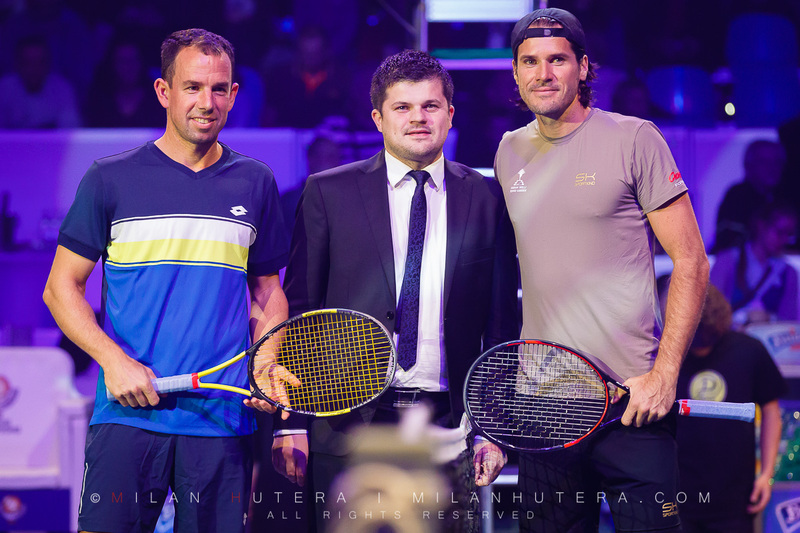 This year’s line-up consisted of WTA Champion from Singapore Dominika Cibulkova, Swiss rising star Belinda Bencic, Czech and Slovak Davis Cup heroes Radek Stepanek and Dominik Hrbaty, as well as first class tennis entertainers Yannick Noah and Mansour Bahrami. 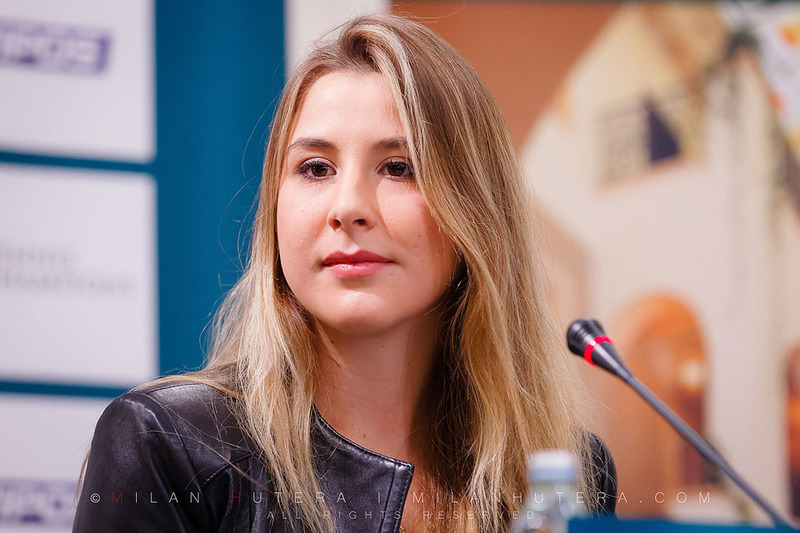 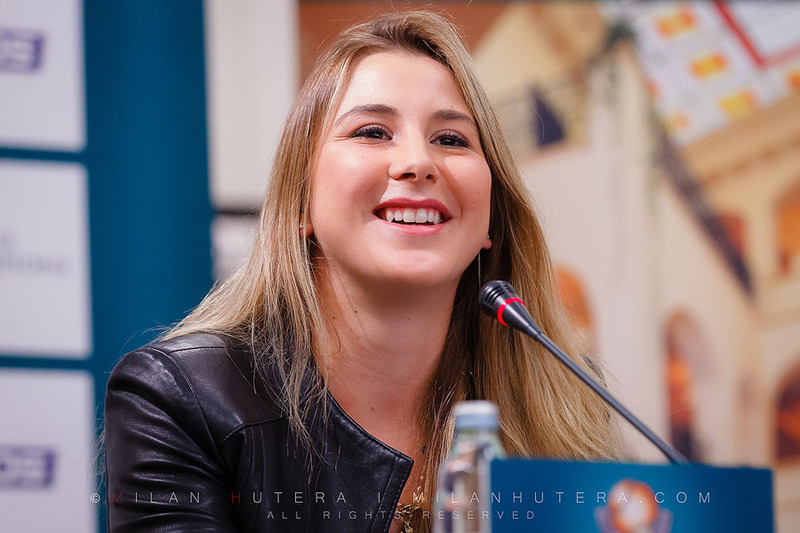 Some of my photos from the event appeared in the articles on WTA Tennis.com and Tennis.com. 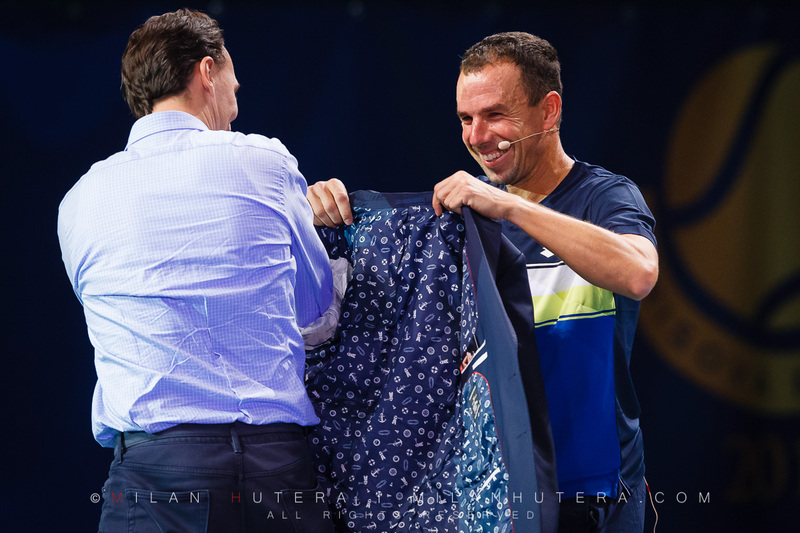 Yesterday I had a chance to attend the 5th annual Tennis Classic exhibition in Bratislava, Slovakia. The line-up for the main singles match was very promissing – the current No. 1 and the winner of the London Masters Novak Djokovic agains the “Newcomer of the Year on ATP Tour” Martin Klizan. 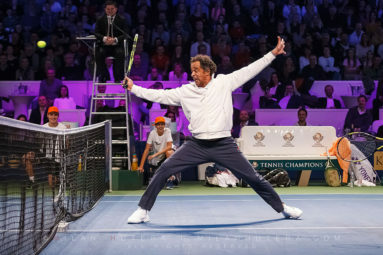 Both players are well known comedians. 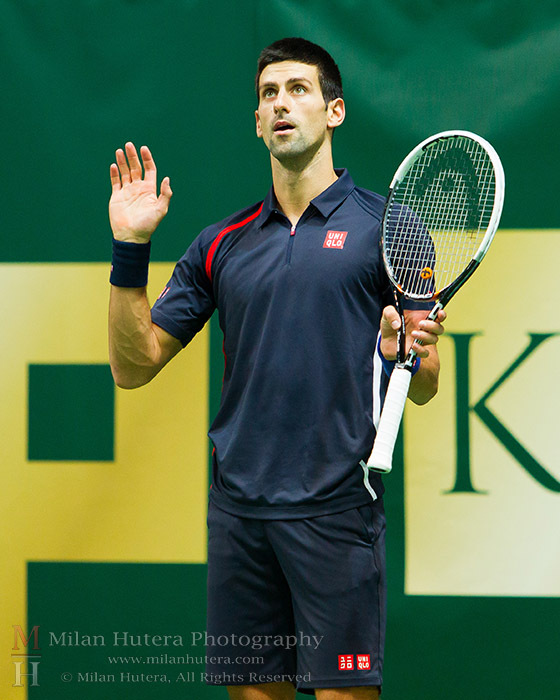 “Nole” Djokovic makes all sorts of pranks on fellow tennis players (both male and female) all the time. 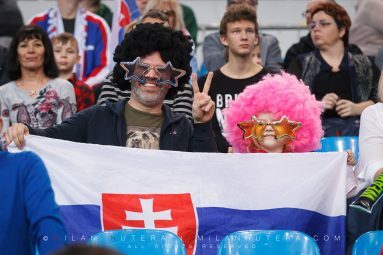 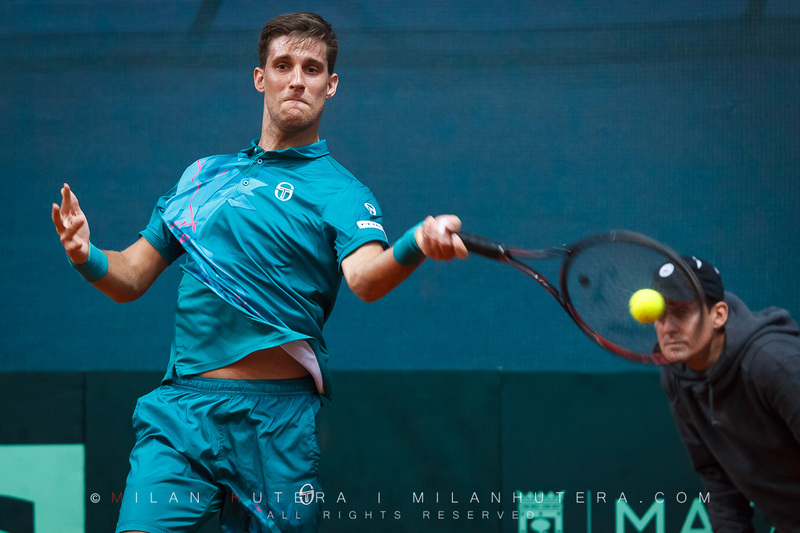 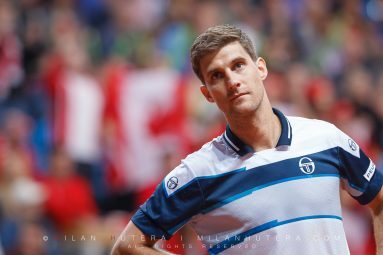 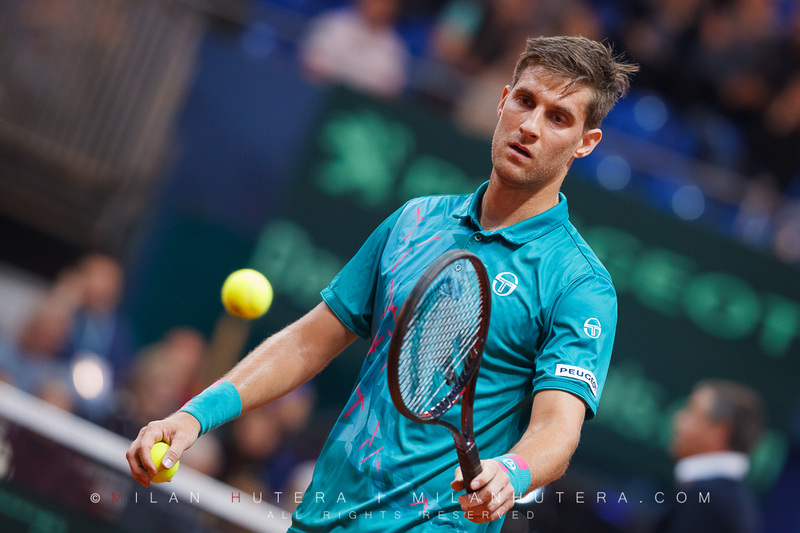 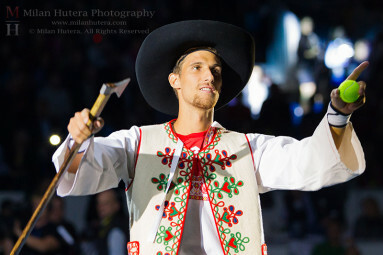 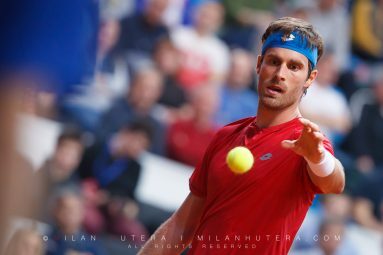 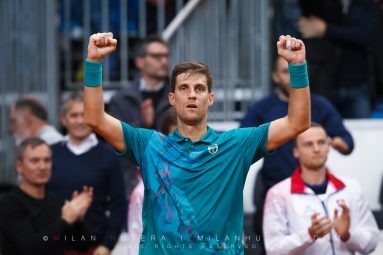 Martin Klizan is a player, who doesn’t hesitate to put on a colorful wig (after the successful Davis Cup tie) or large, colorful glasses and a hat (after winning a tournament). 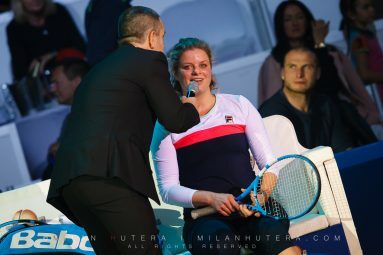 Naturally I expected a great show from both of them. Unfortunately, Martin probably left his sense of humor in the locker room yesterday. 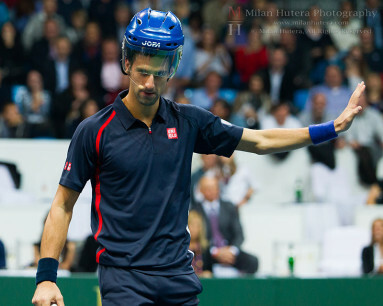 It seemed he was trying too hard to play regular tennis match (and beat the World No. 1), instead of entertaining the audience. On the other hand, Novak had a lot of funny lines, moments and impersonated several top male and female players (including Serena Williams). In the end, Novak Djokovic not only won sympathies of the sold-out arena, but also claimed the match in two sets 7:5, 6:3. 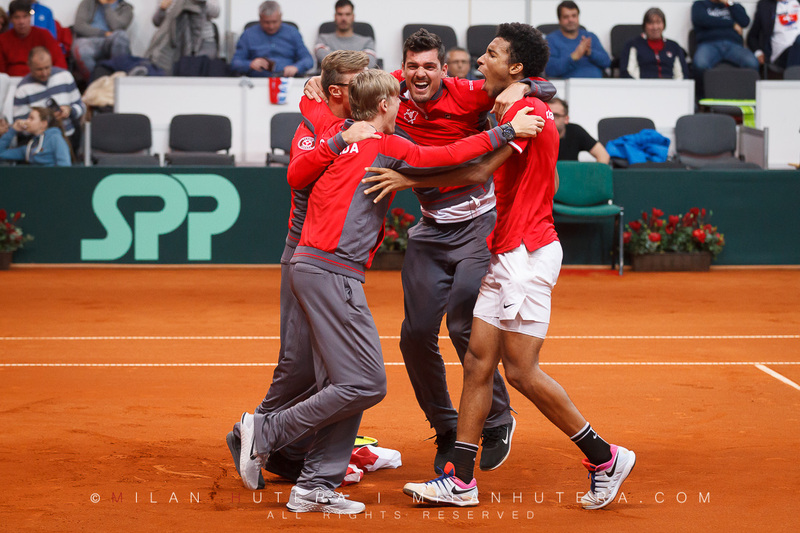 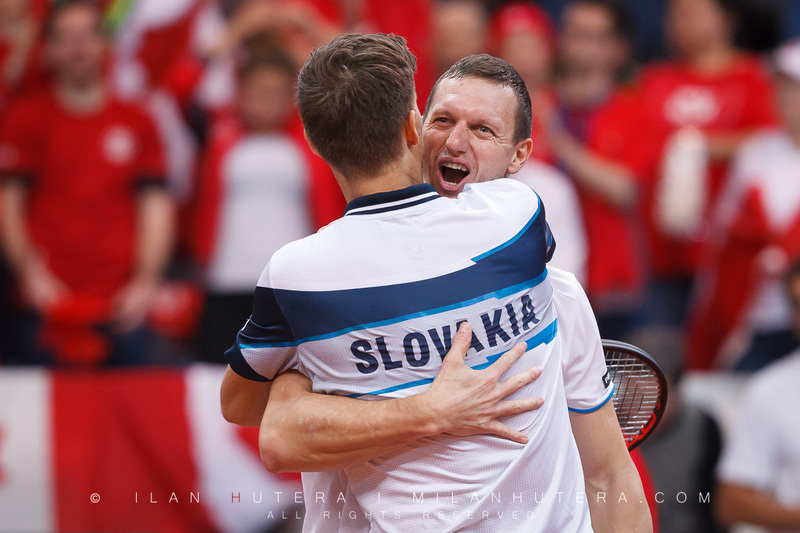 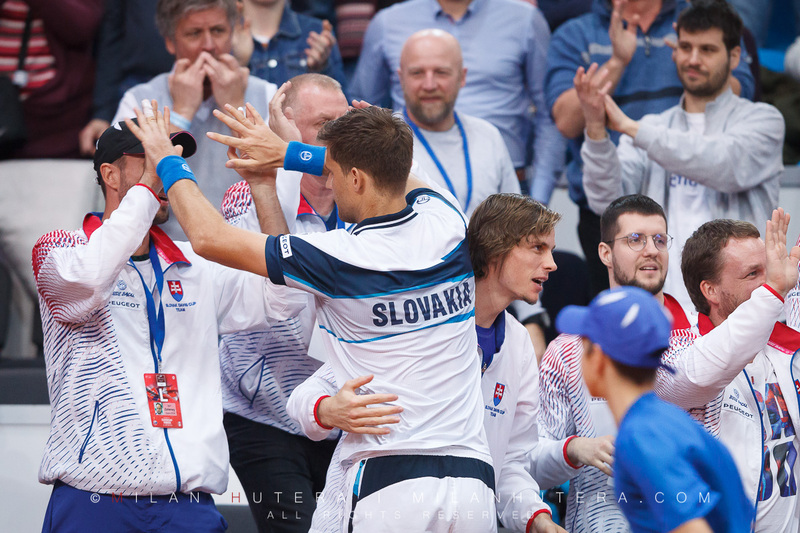 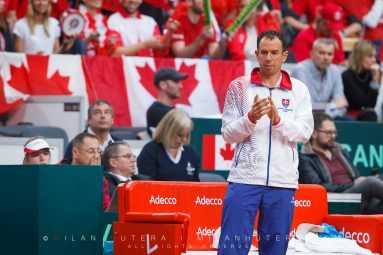 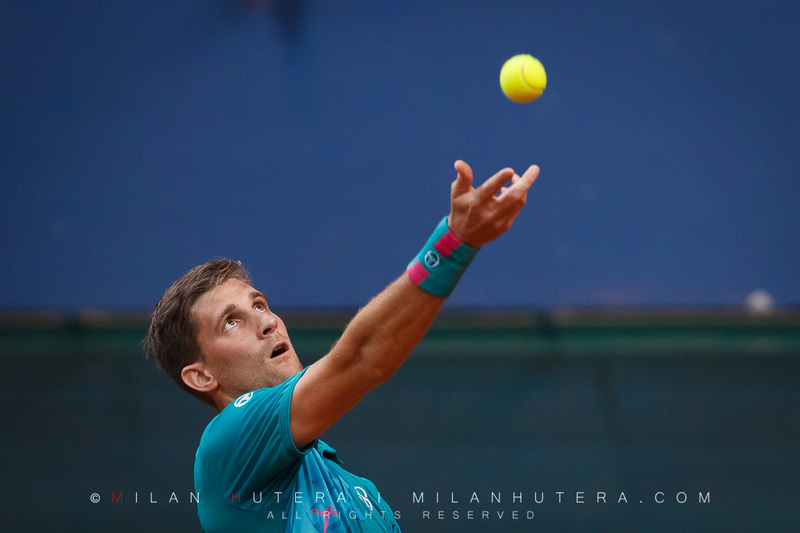 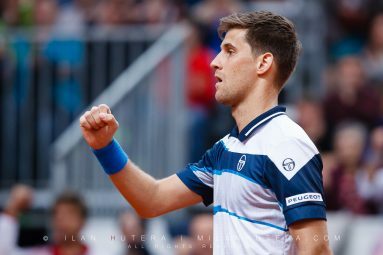 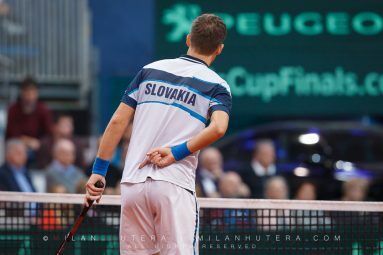 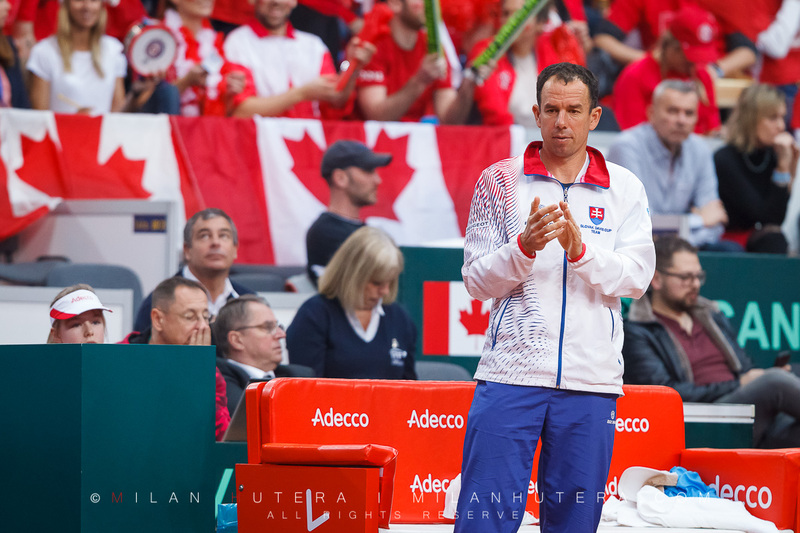 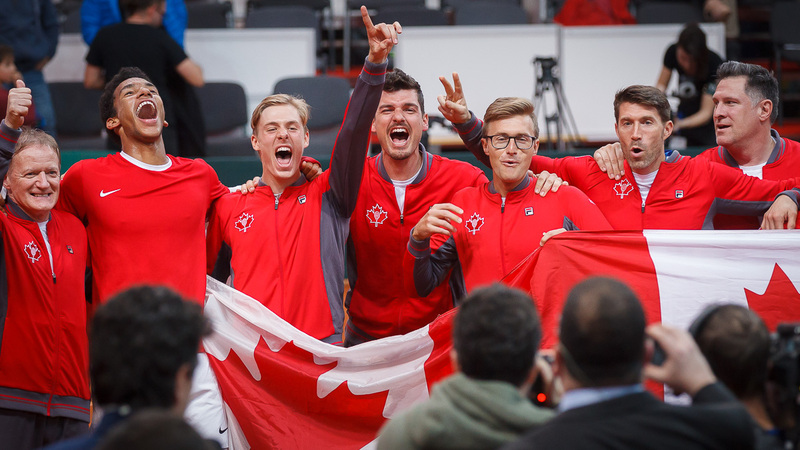 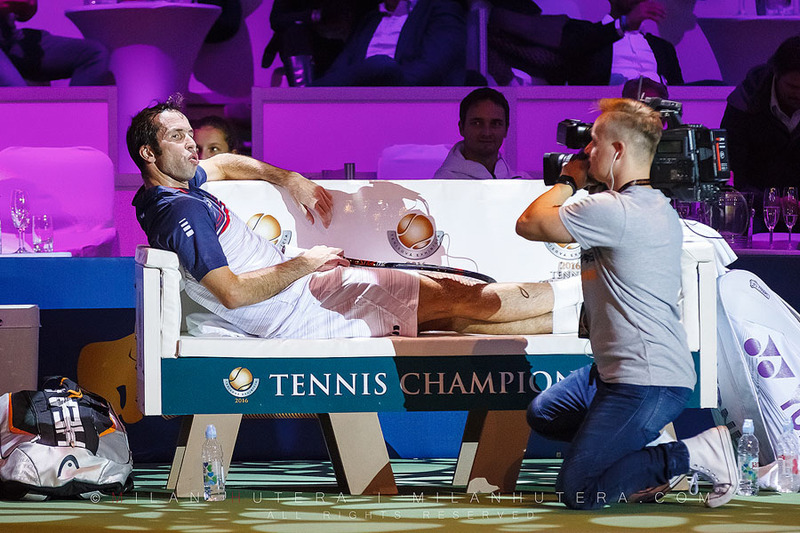 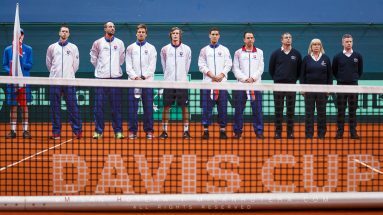 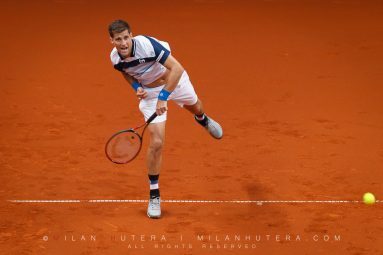 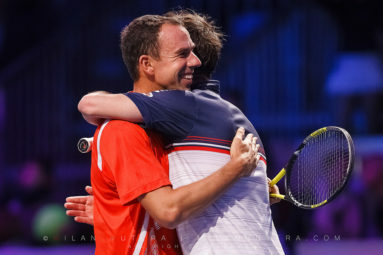 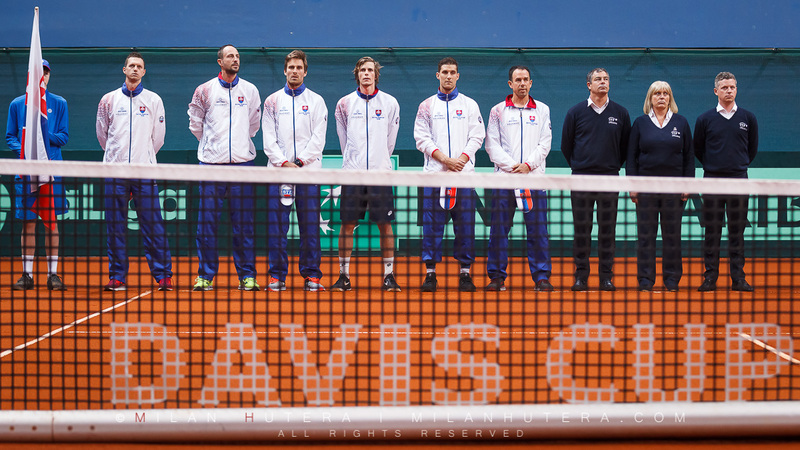 In the doubles match, Novak Djokovic teamed up with his long-time coach and former tennis player Marian Vajda and Martin Klizan was helped-out by the Slovak Davis Cup hero Dominik Hrbaty. 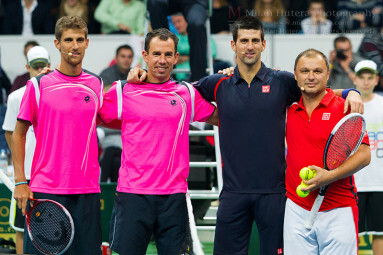 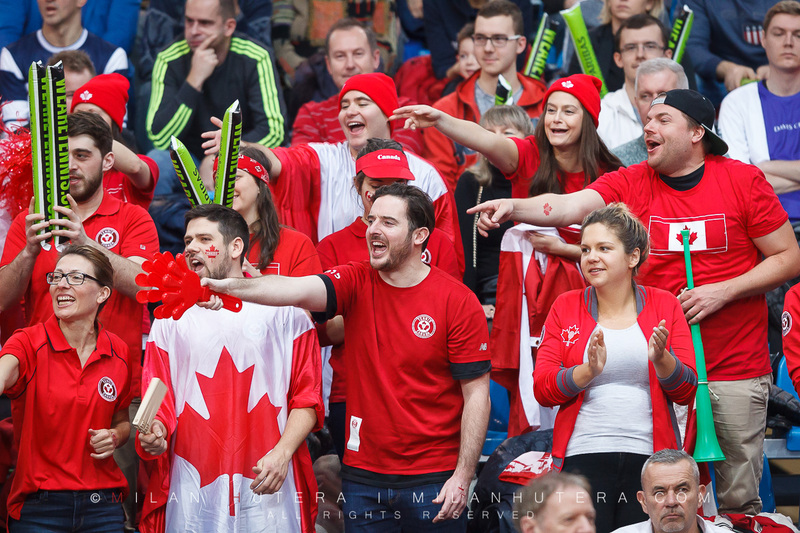 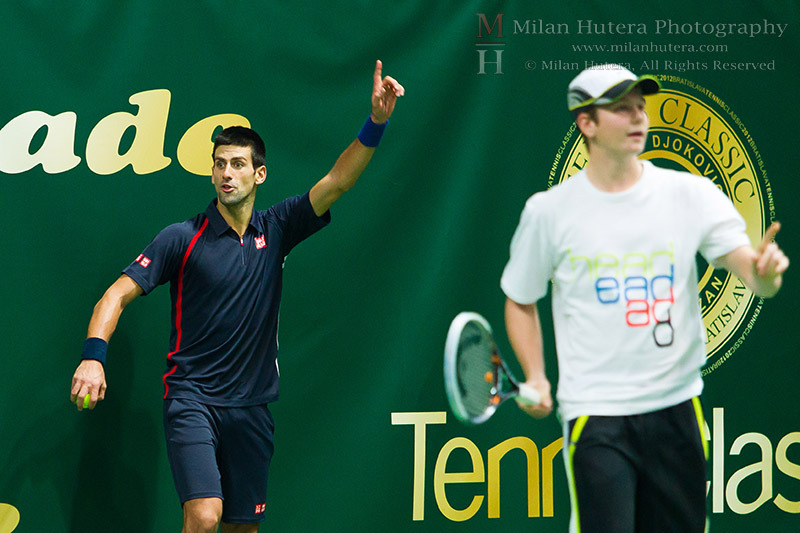 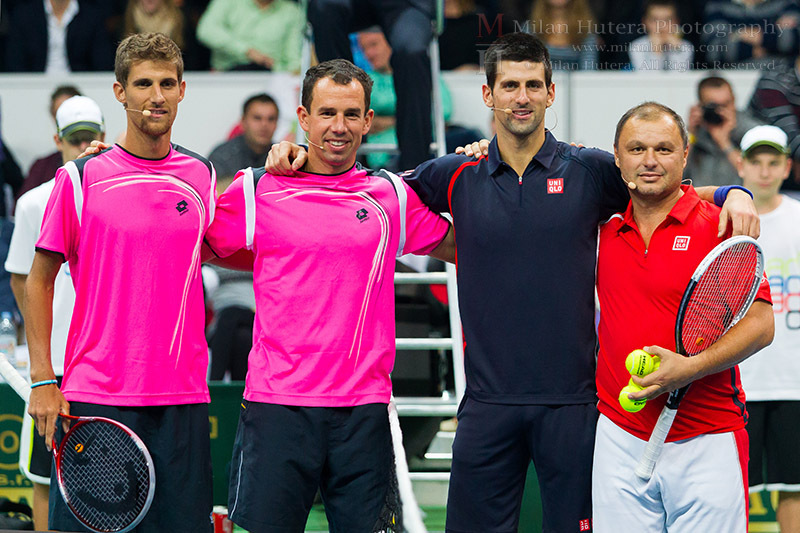 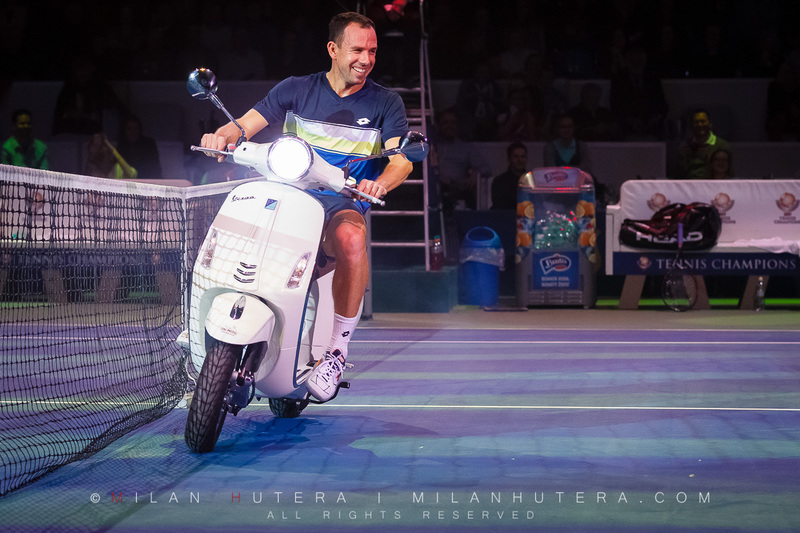 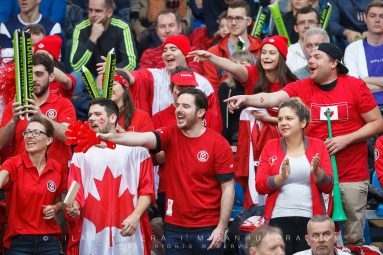 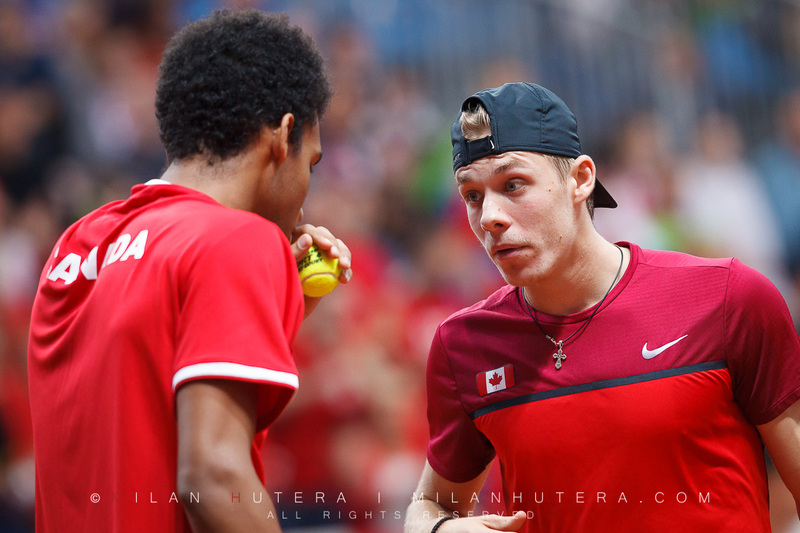 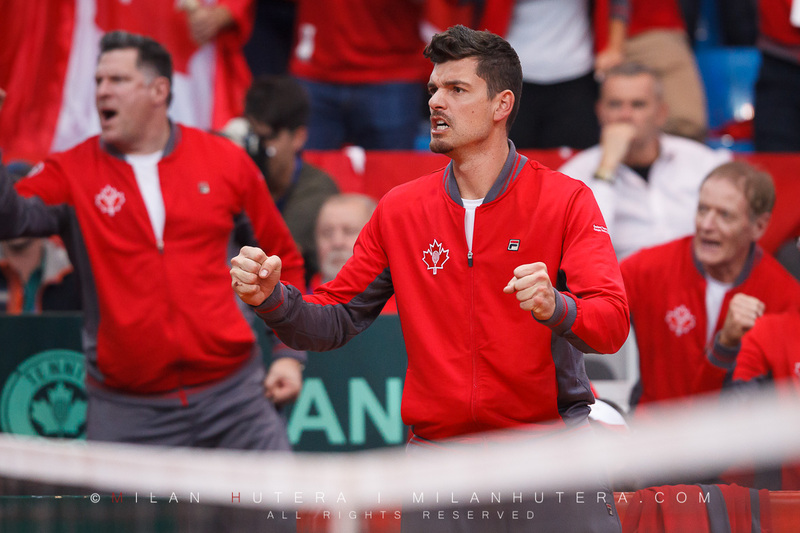 Again, it seemed Marian and Novak enjoyed being on court so much more than Martin and Dominik. The “fun” potential of this exhibition match was enormous, however the evening wasn’t as great as I hoped. 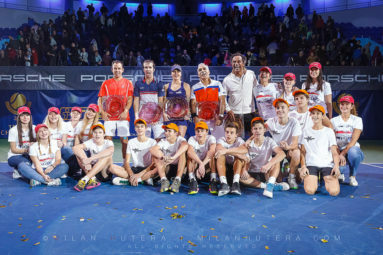 Unfortunately, photographying the event was a nightmare. 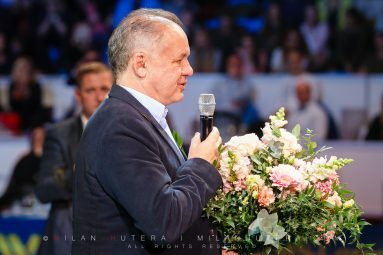 Apparently, the stars and the moderator weren’t instructed (or simply forgot) there was a booth full of photographers and camera men, who’d love to capture all the official ceremonies. We spent the evening looking at their backs instead. I sincerely hope this won’t happen next time. 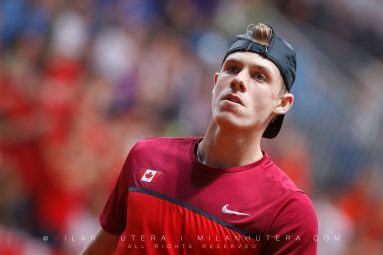 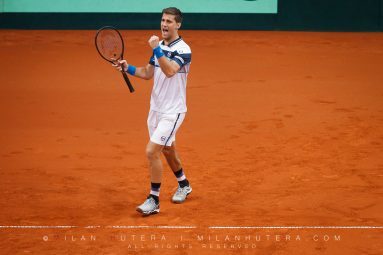 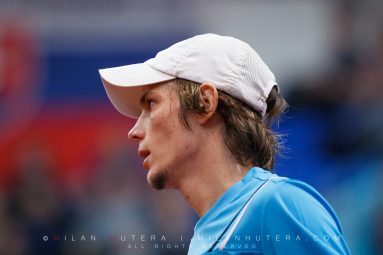 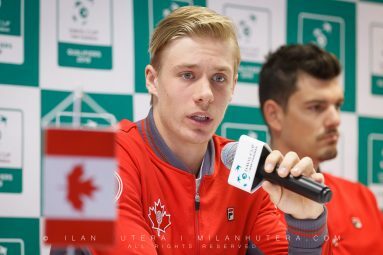 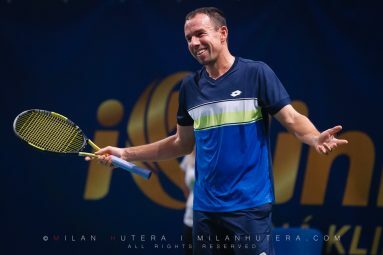 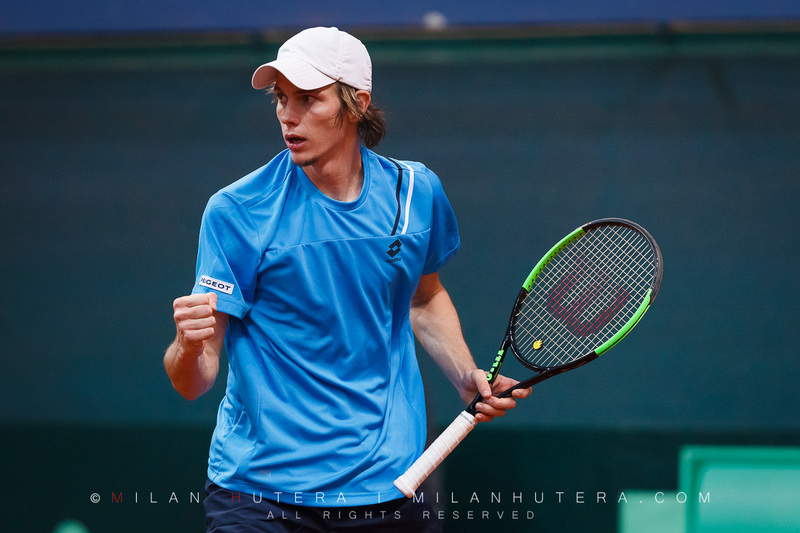 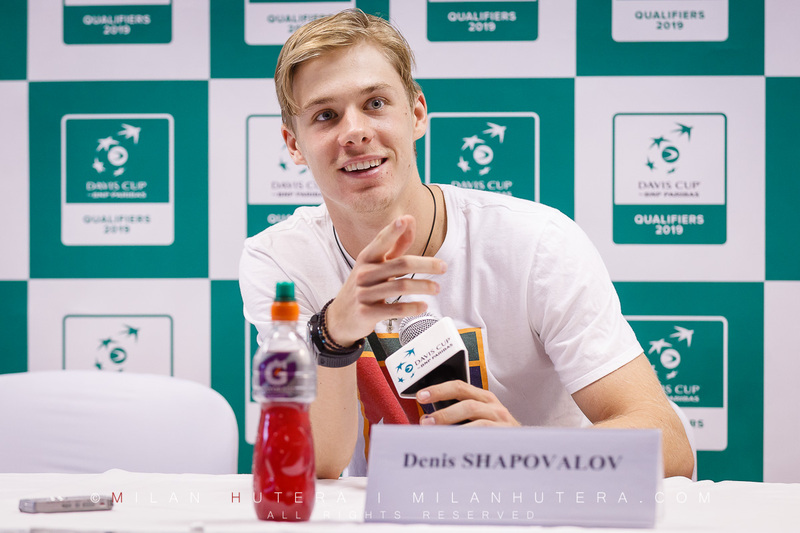 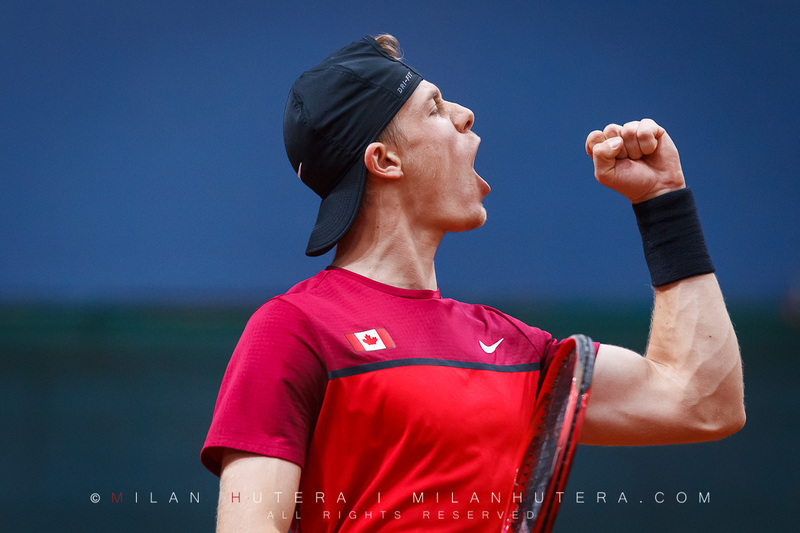 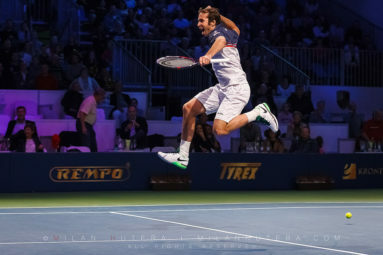 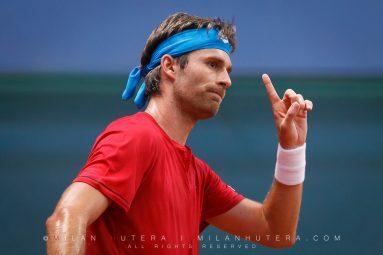 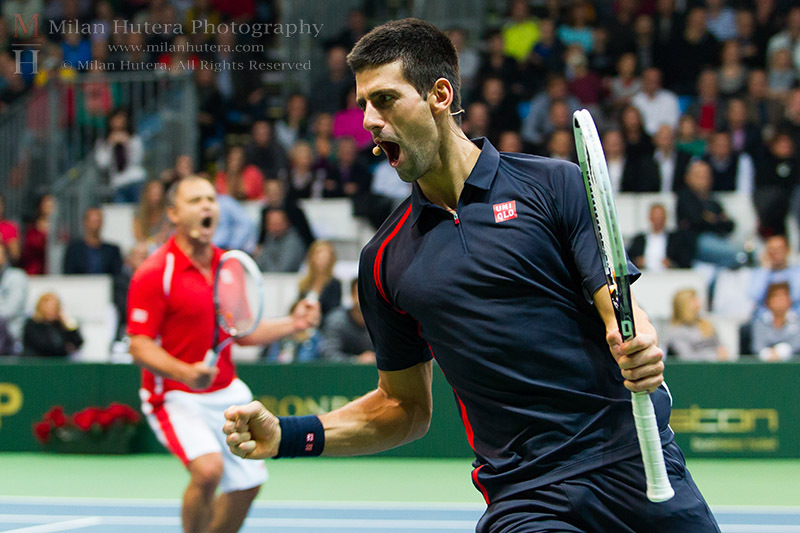 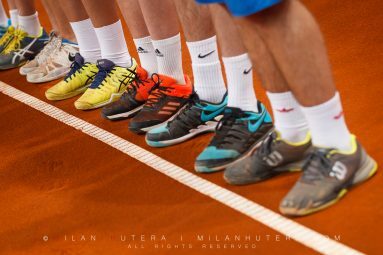 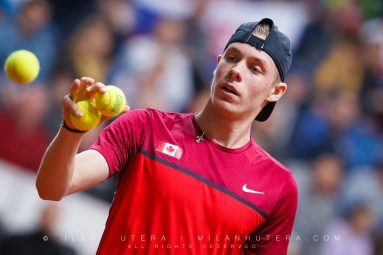 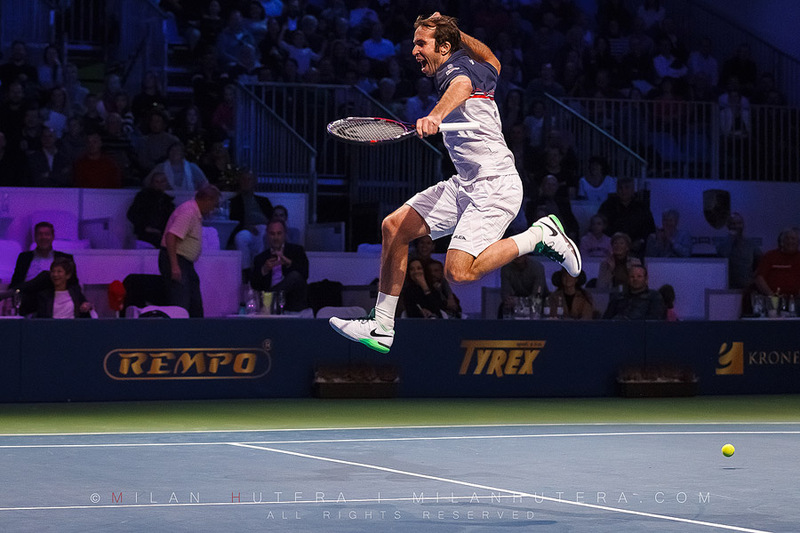 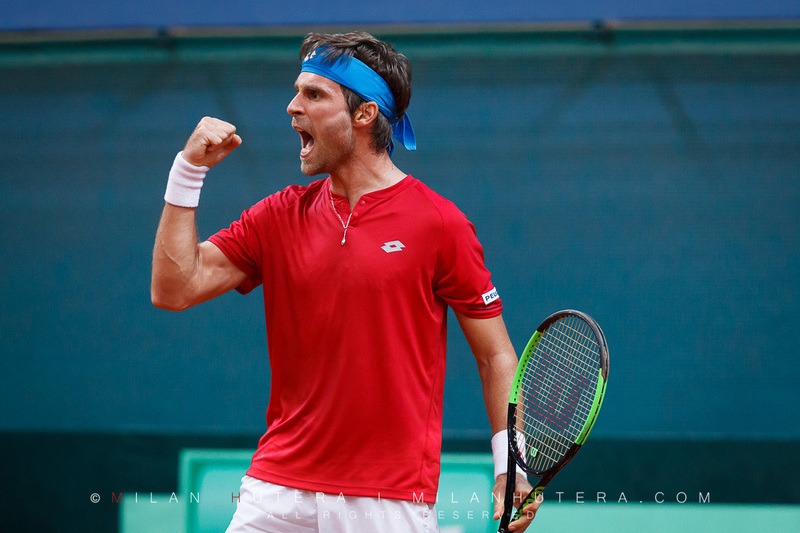 You can find more than 50 photos from Tennis Classic 2012 on my blog: http://hutera.blog.sme.sk/c/313322/Tennis-Classic-2012.html and a selection of my favorite photographs below.